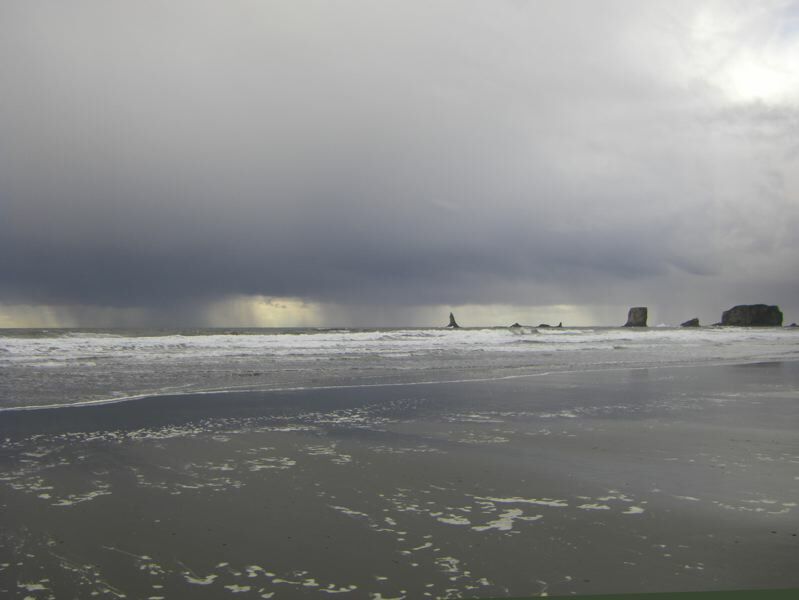 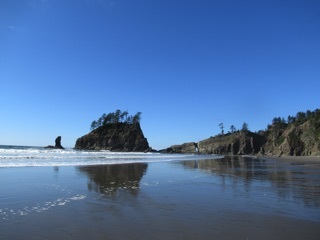 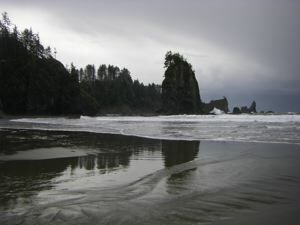 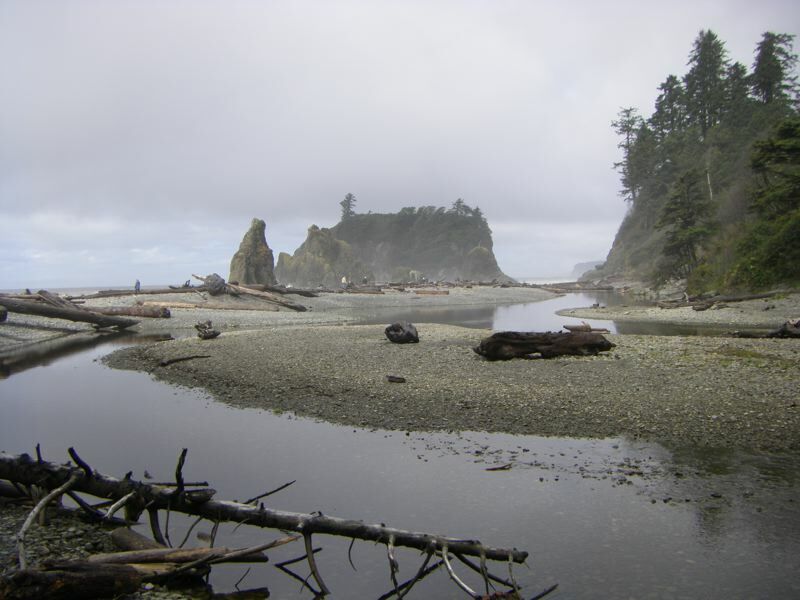 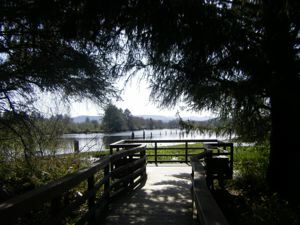 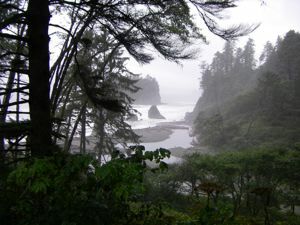 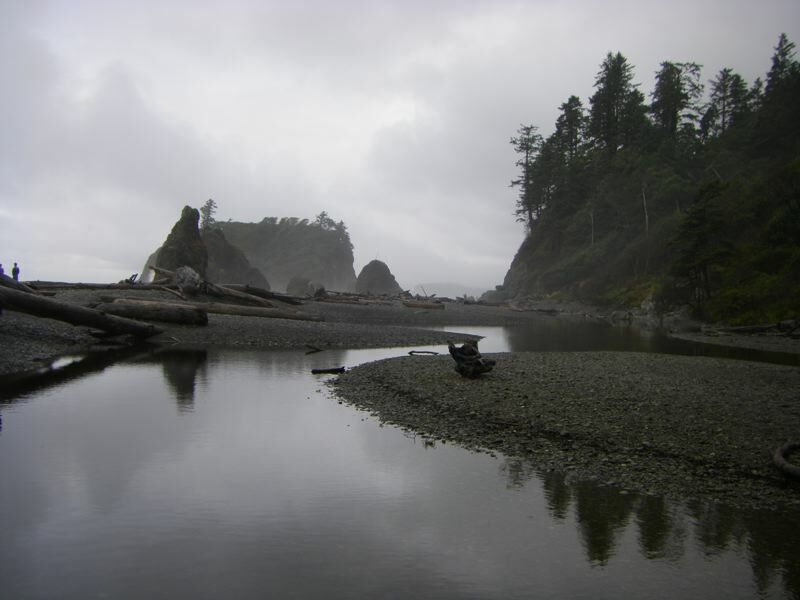 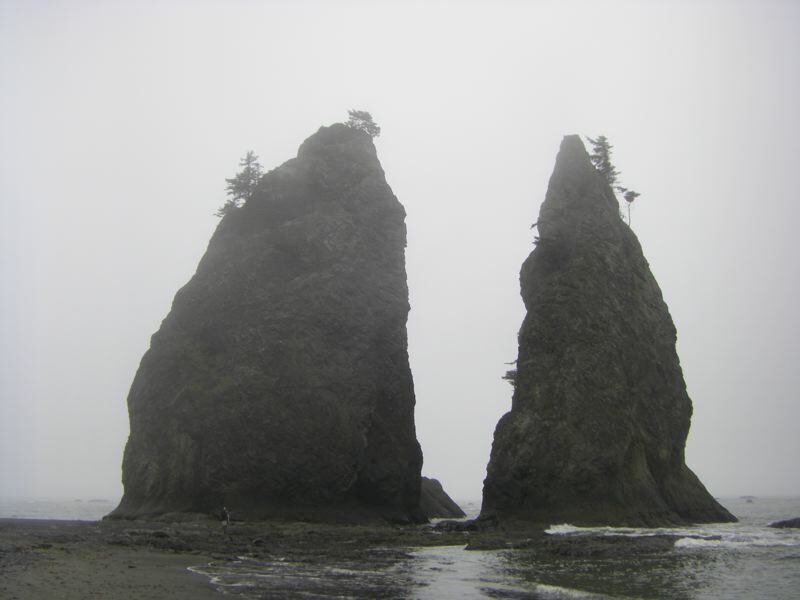 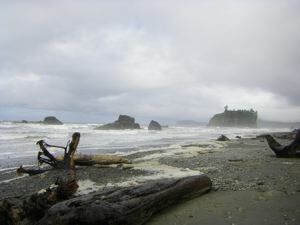 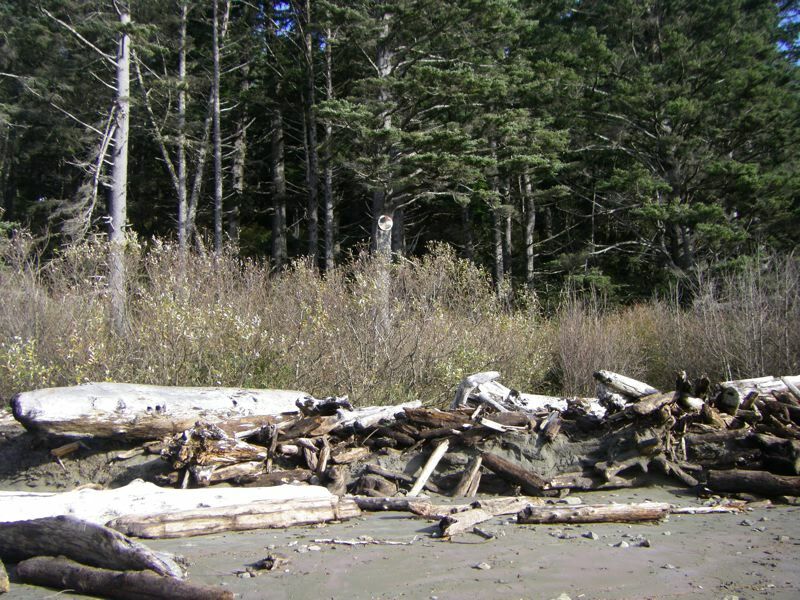 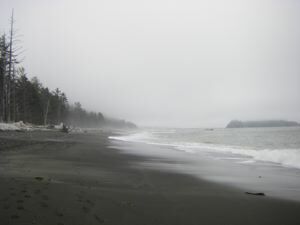 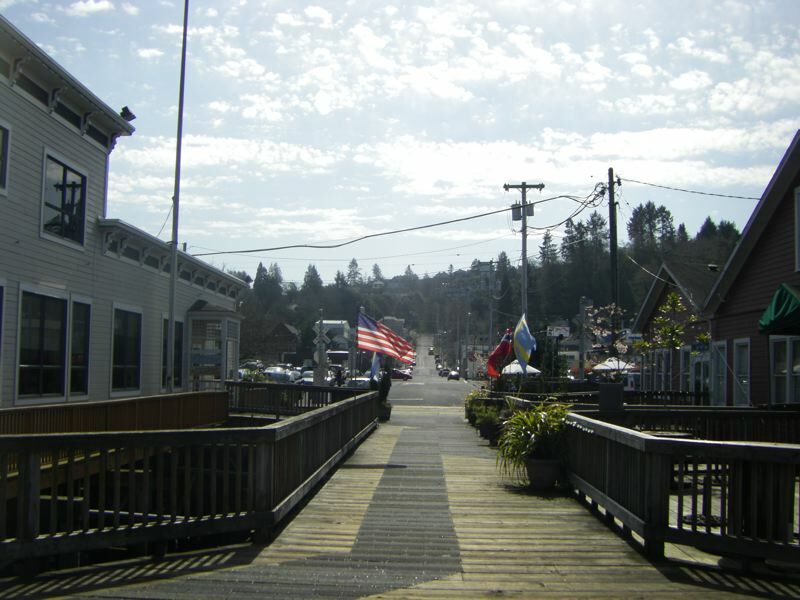 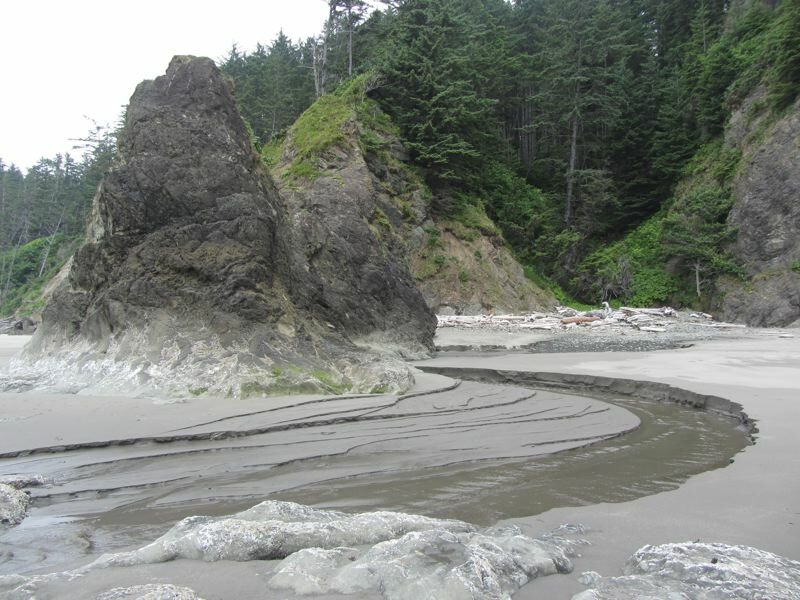 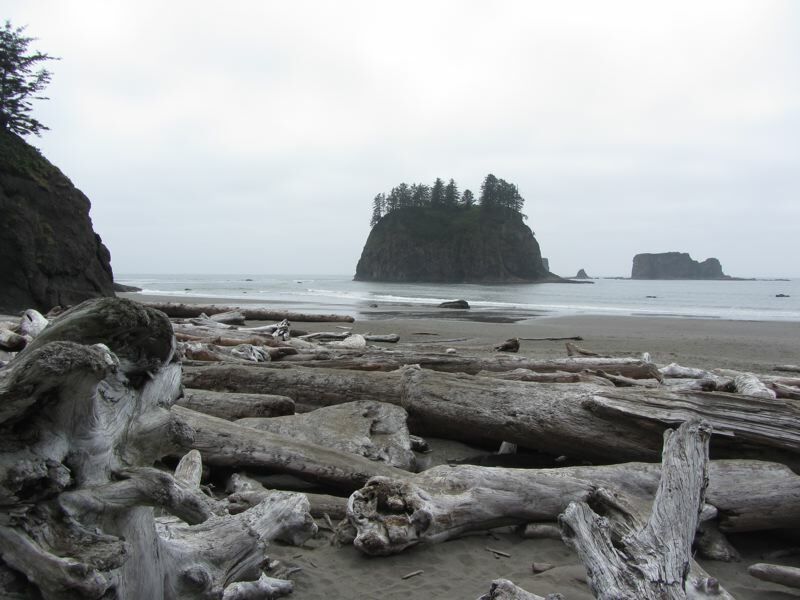 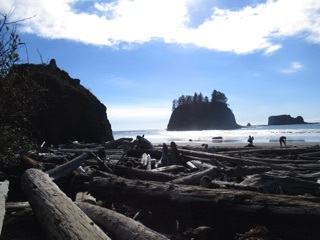 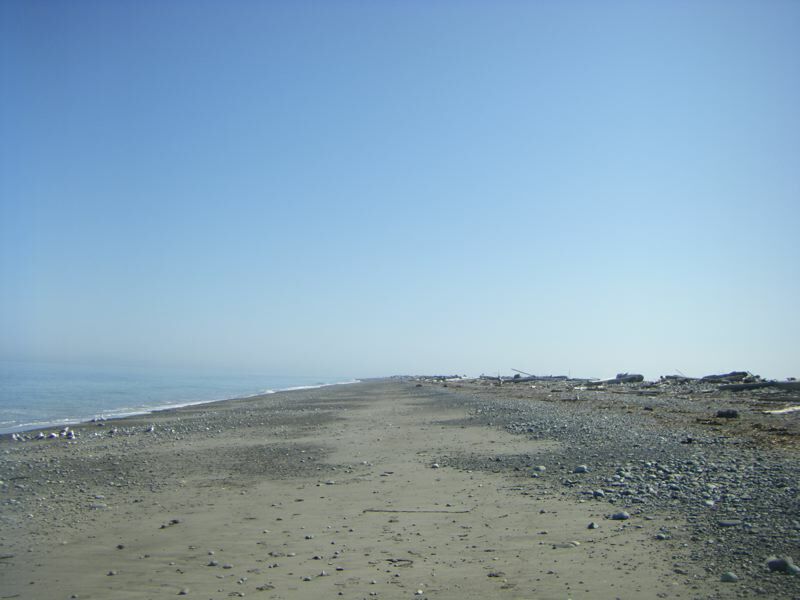 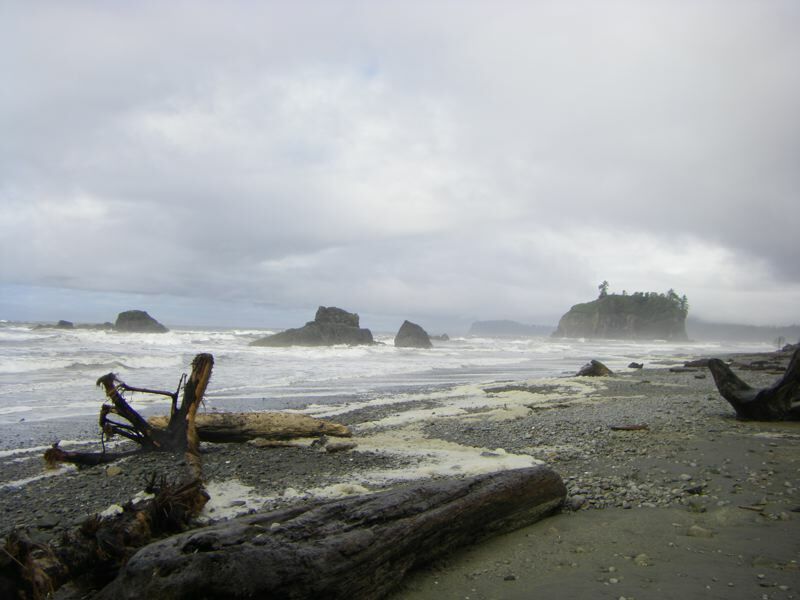 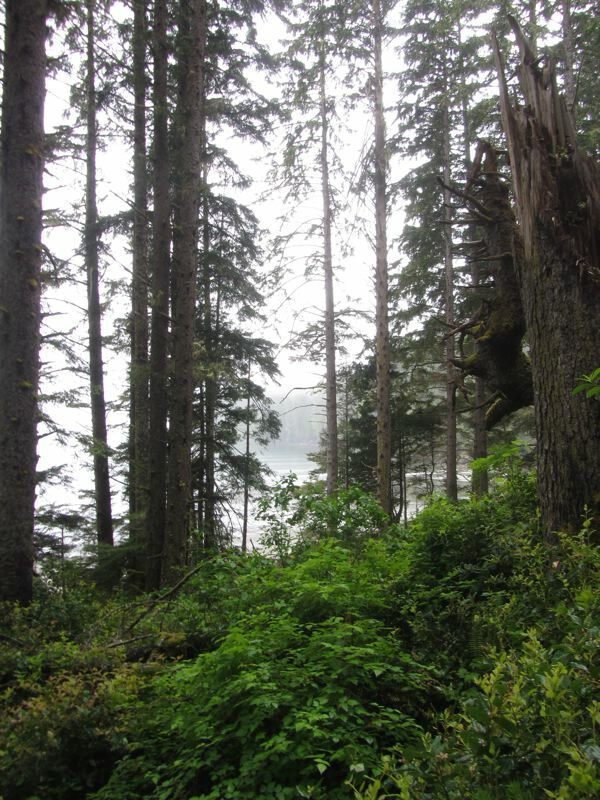 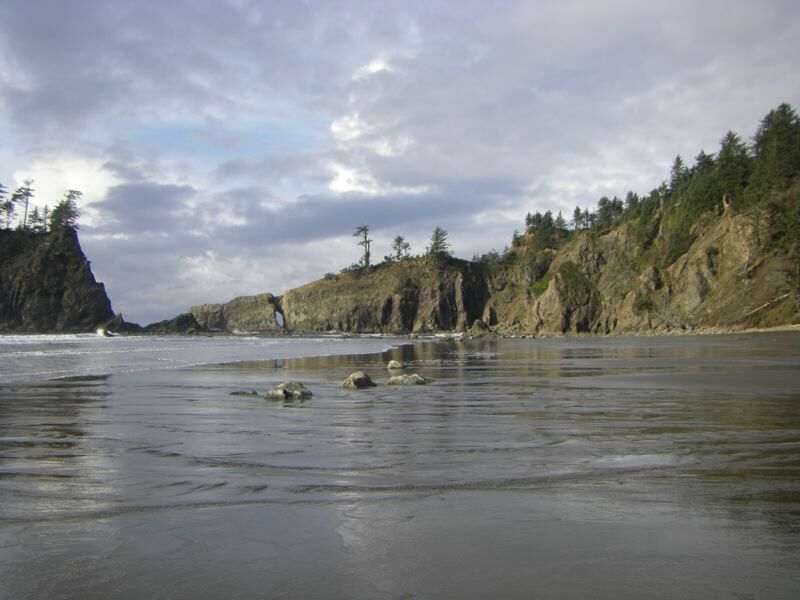 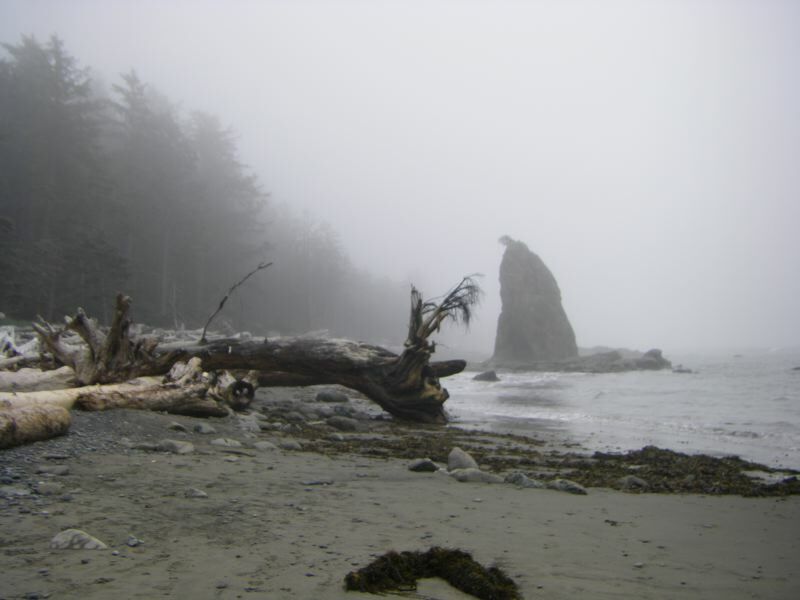 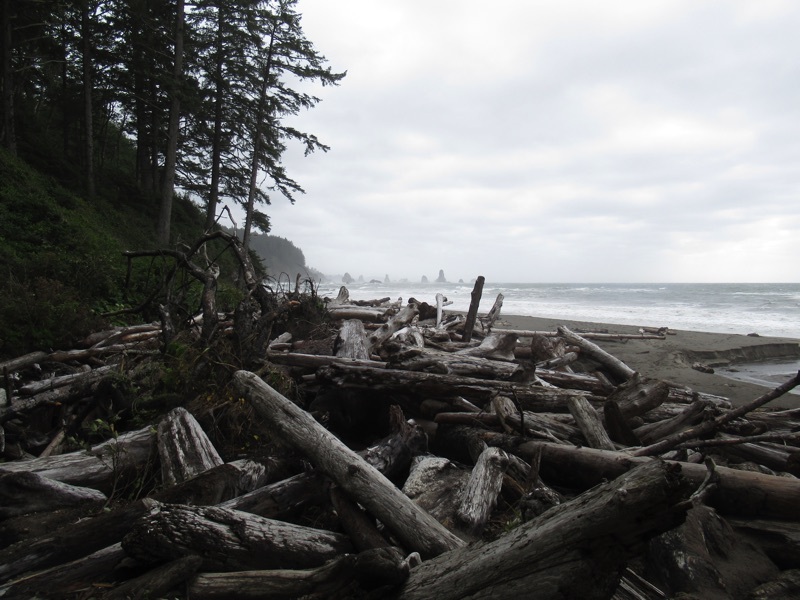 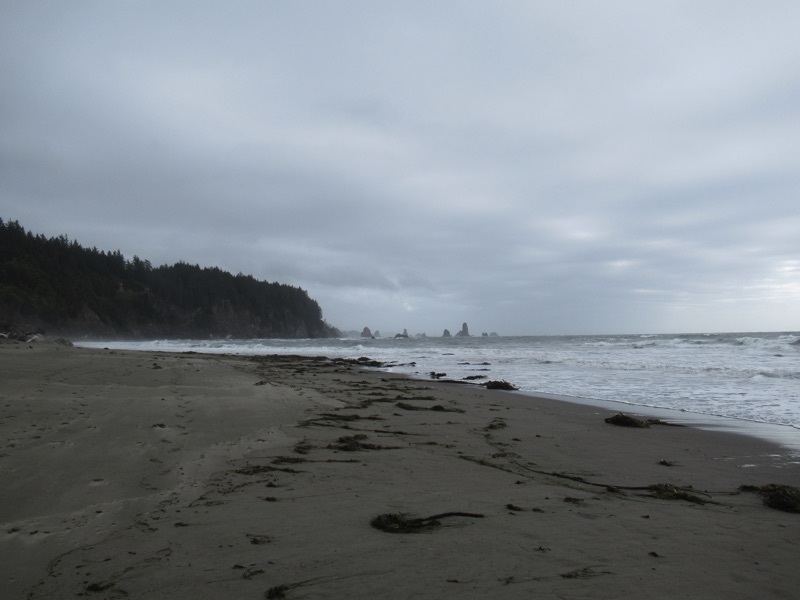 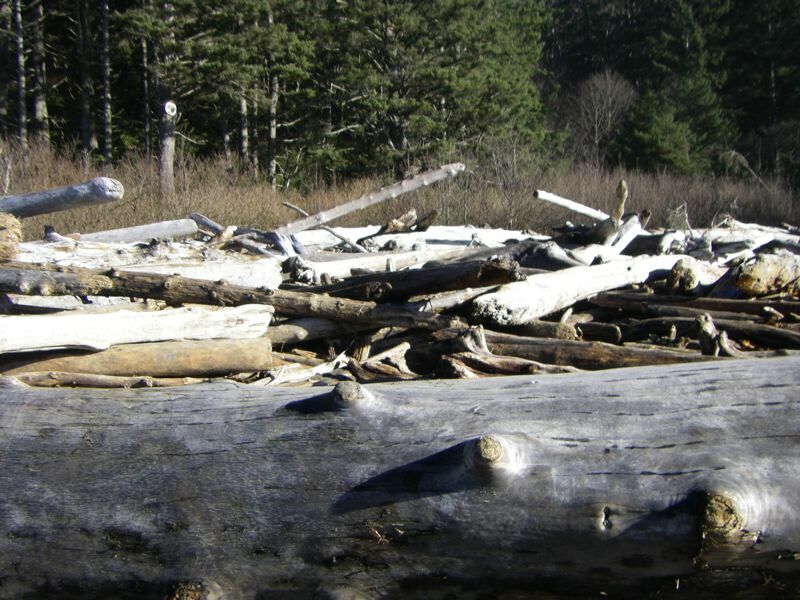 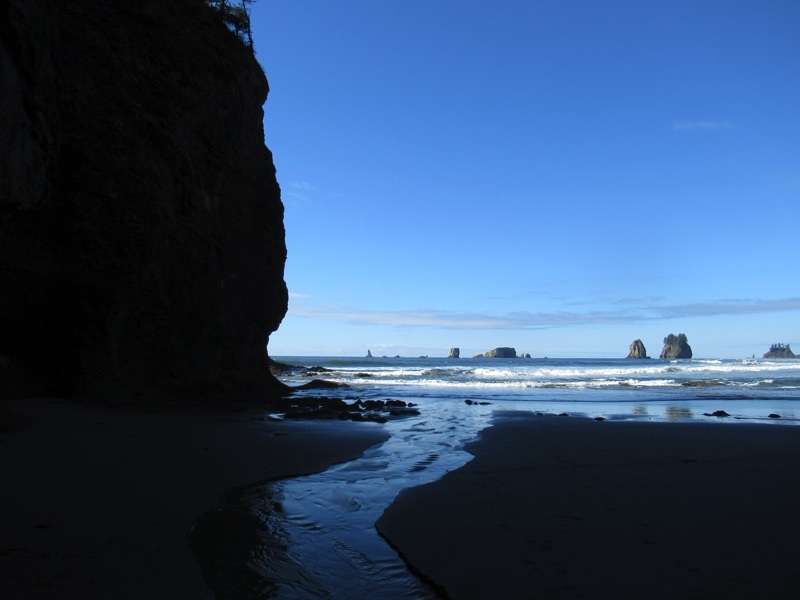 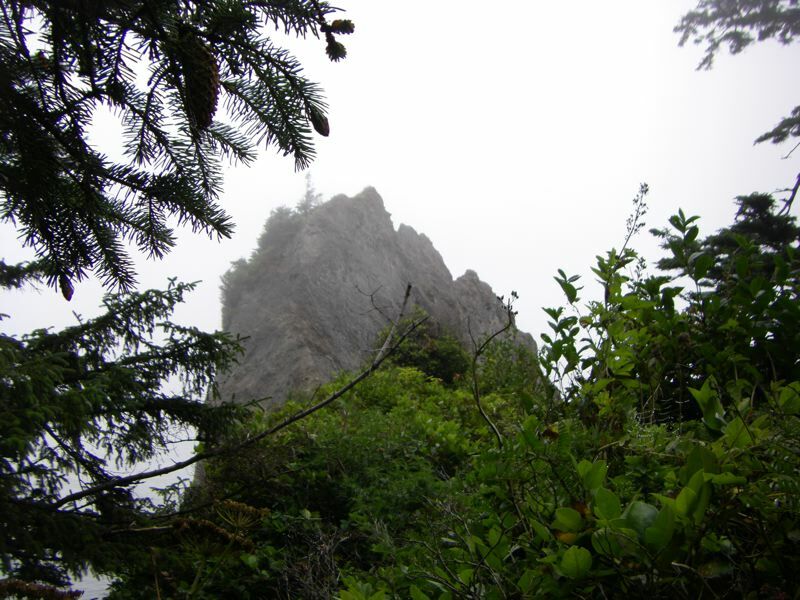 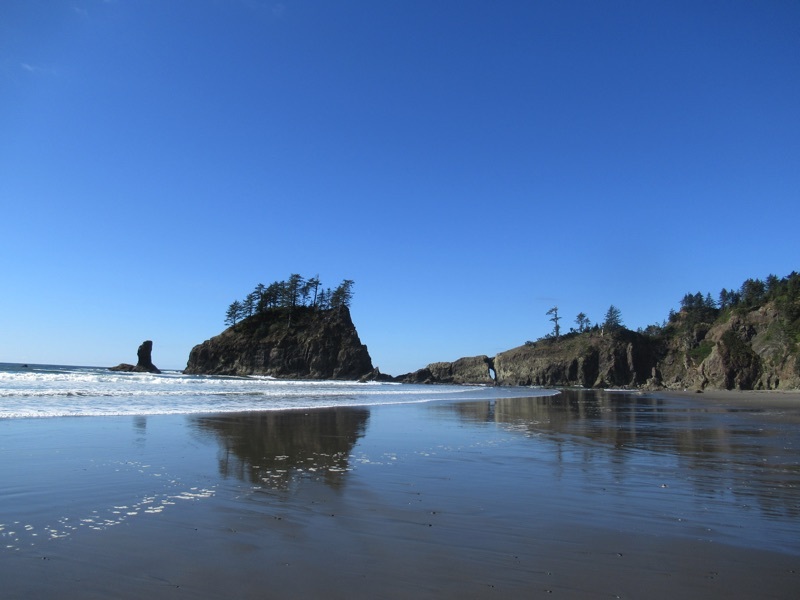 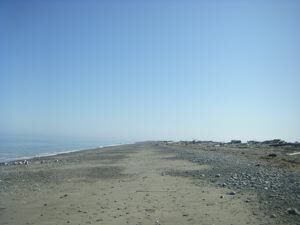 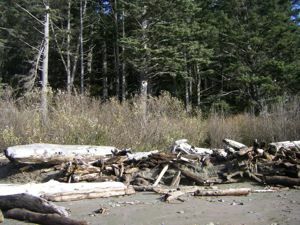 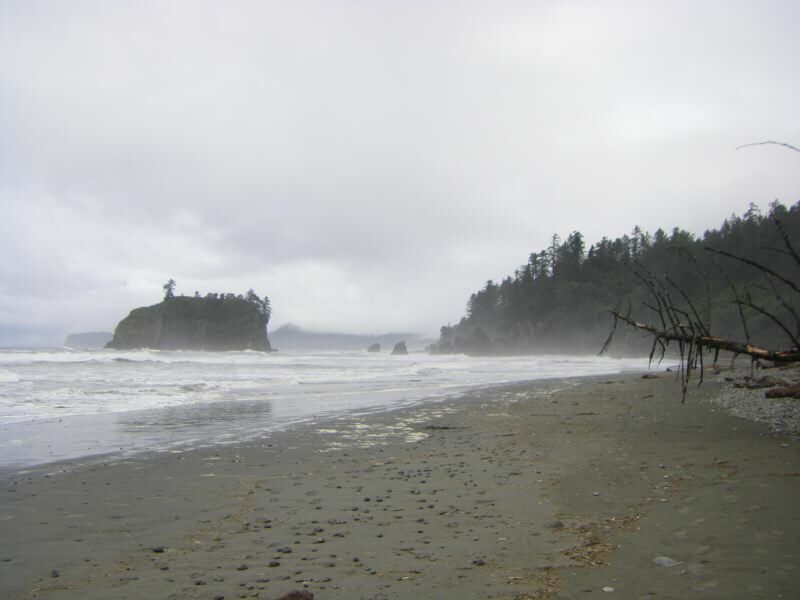 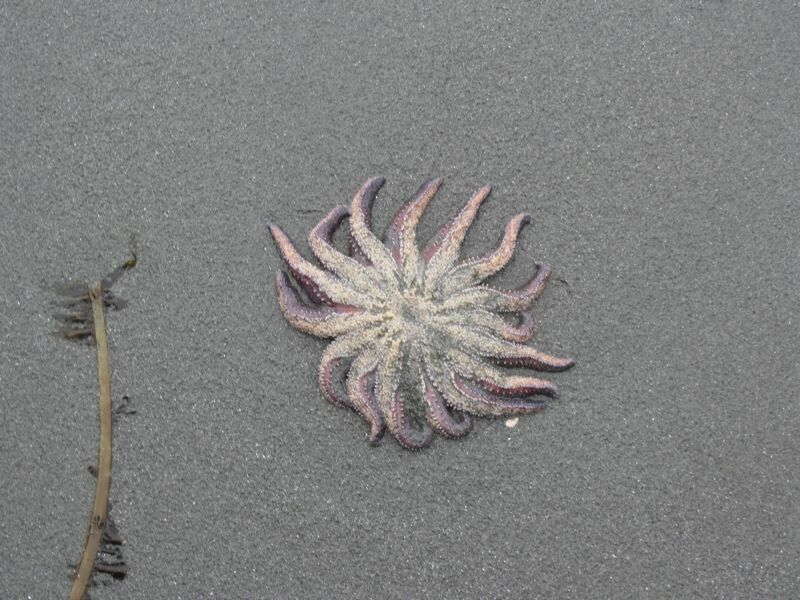 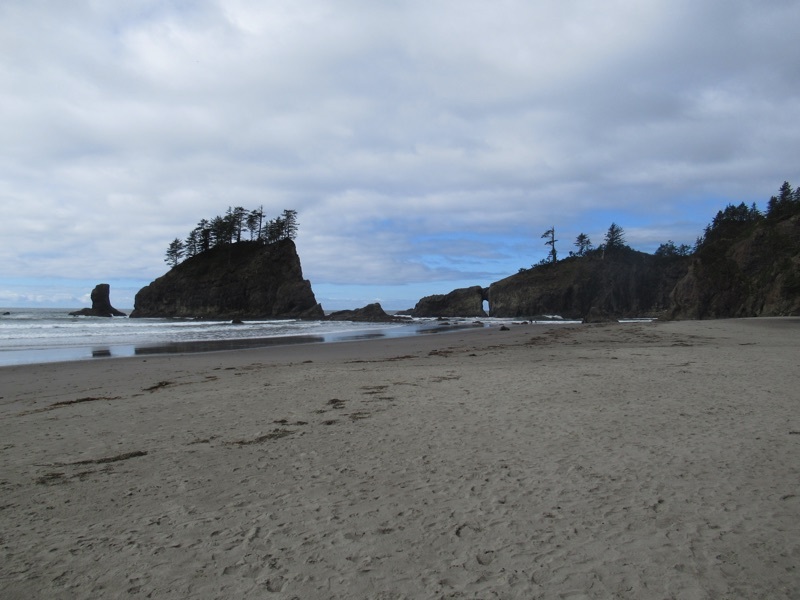 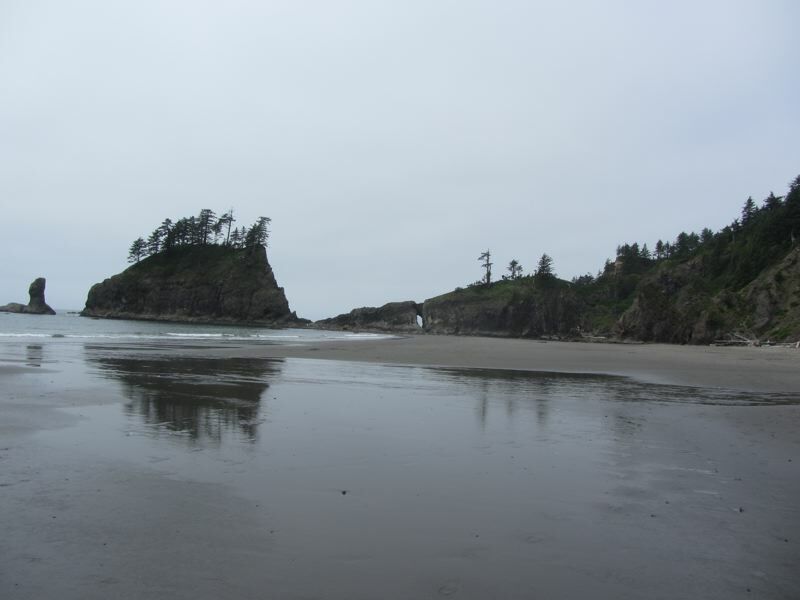 For more on the West End Beaches of the North Olympic Peninsula, see our West End Beaches page. 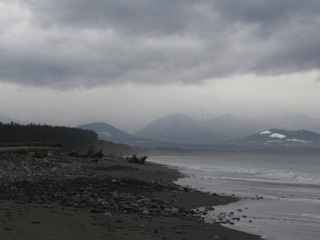 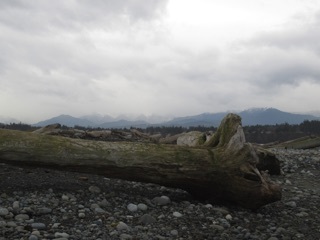 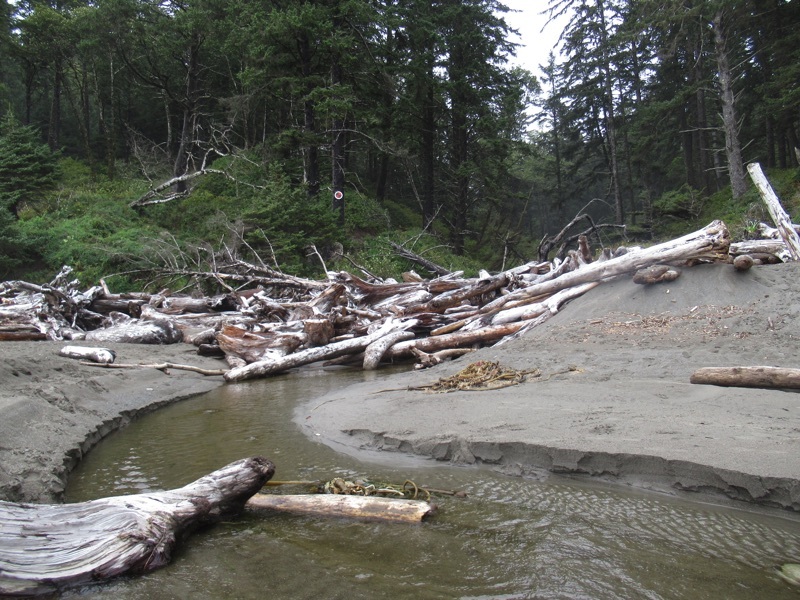 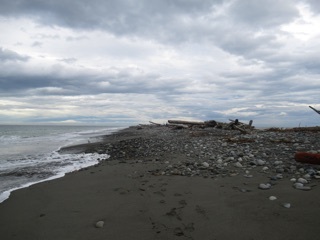 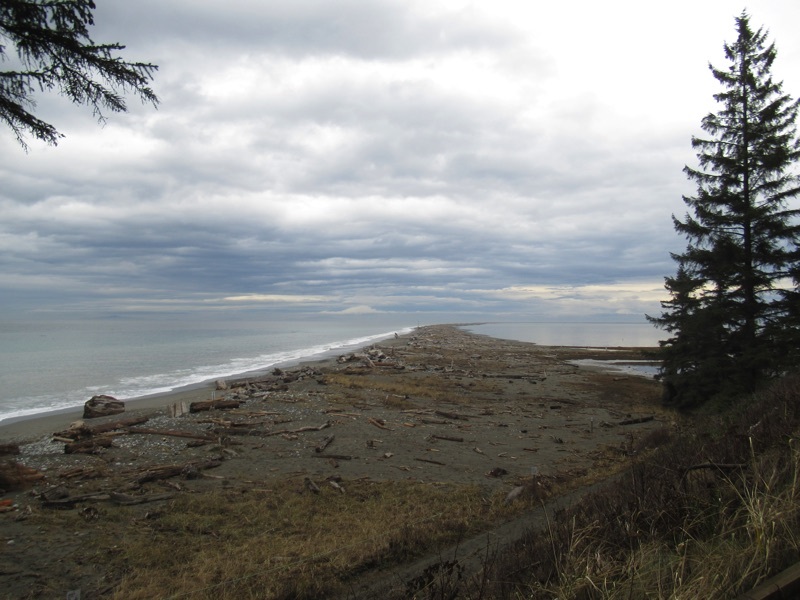 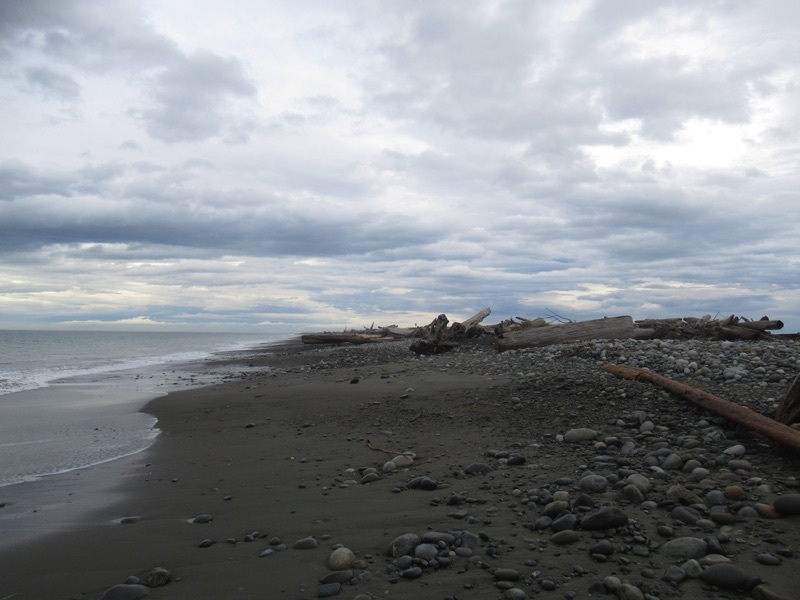 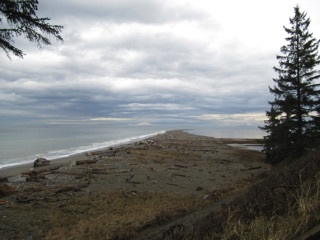 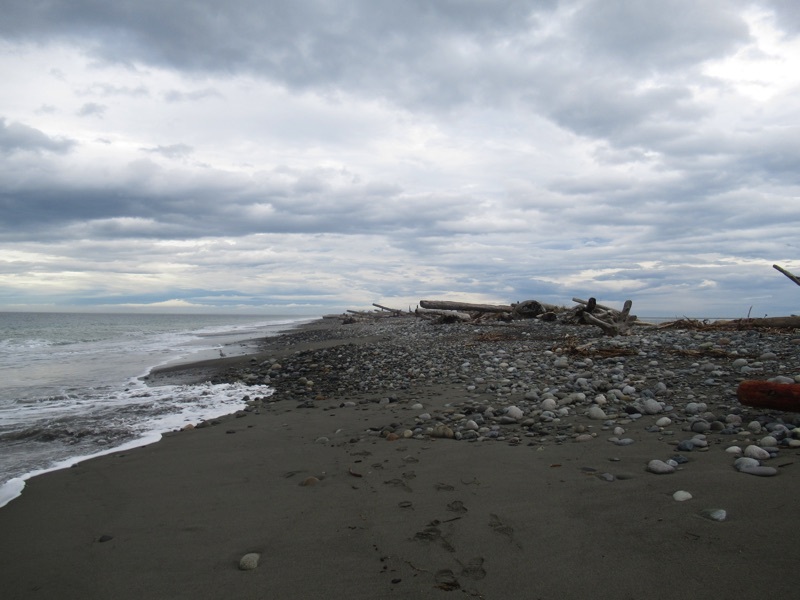 With the Elwha Valley trails and the Spruce Railroad Trail closed we’ve been getting back to the west coast beaches. We had explored Rialto Beach and made our way to the coast at Third Beach, so this time we checked out Second Beach, which is probably our favorite. 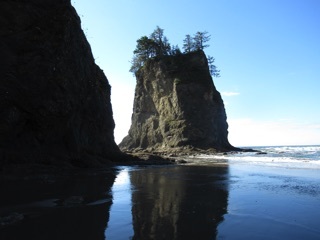 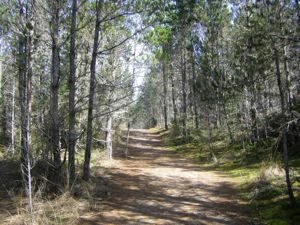 The day was bright, and the tide was low, so we made our way through the forest, down the bluff and then south along the beach to the sea cave and tide pools. 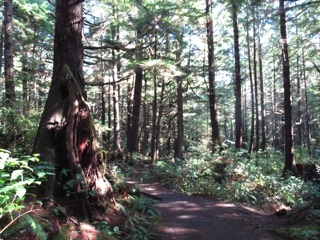 It was an easy, relaxing walk, though we were both tired on the climb back. 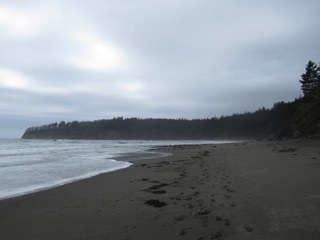 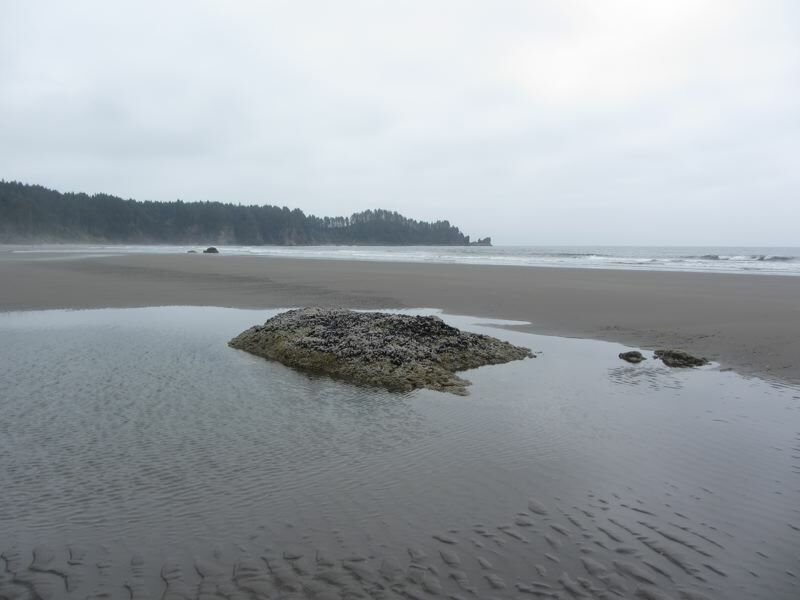 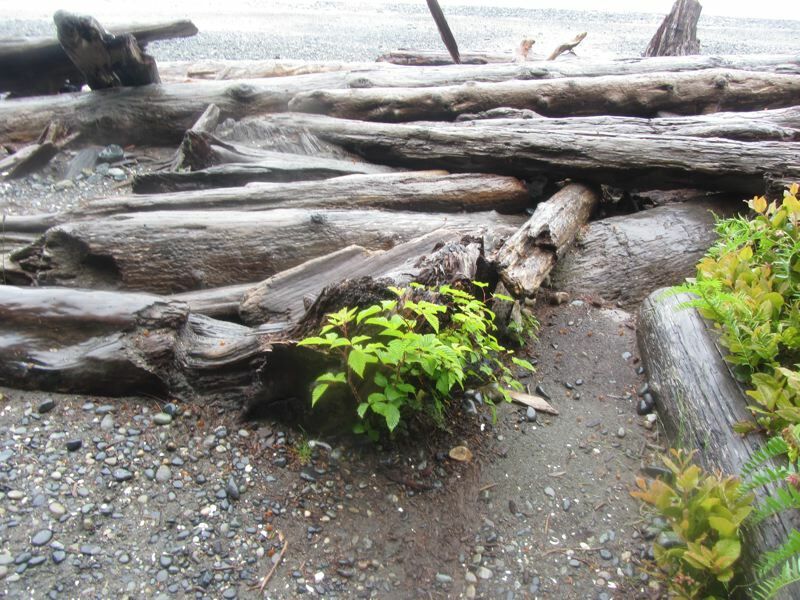 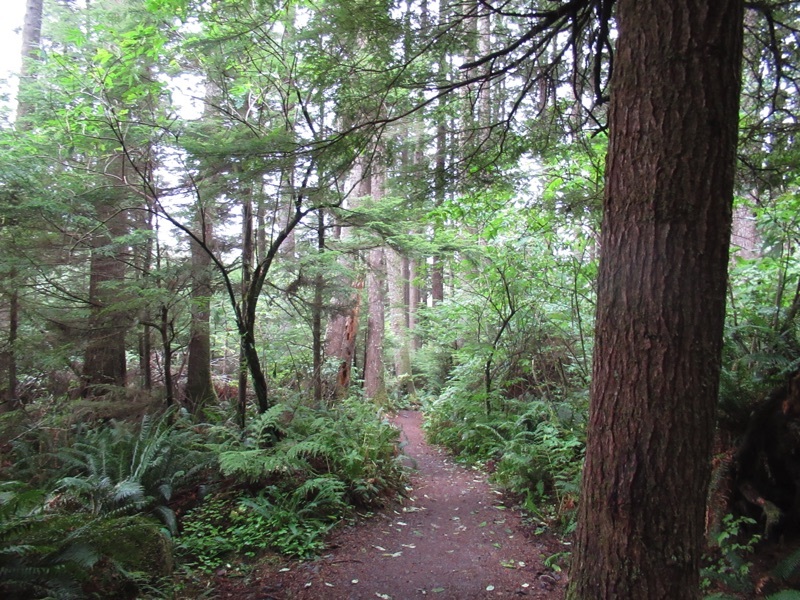 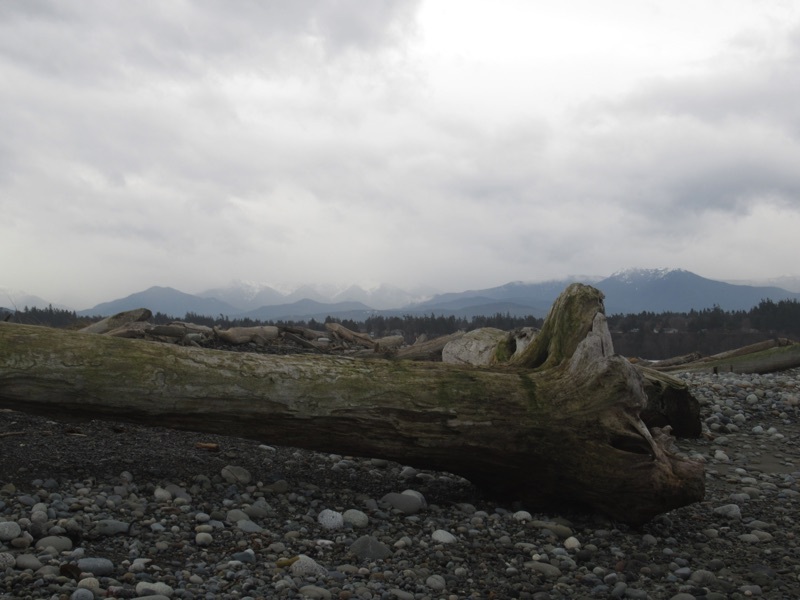 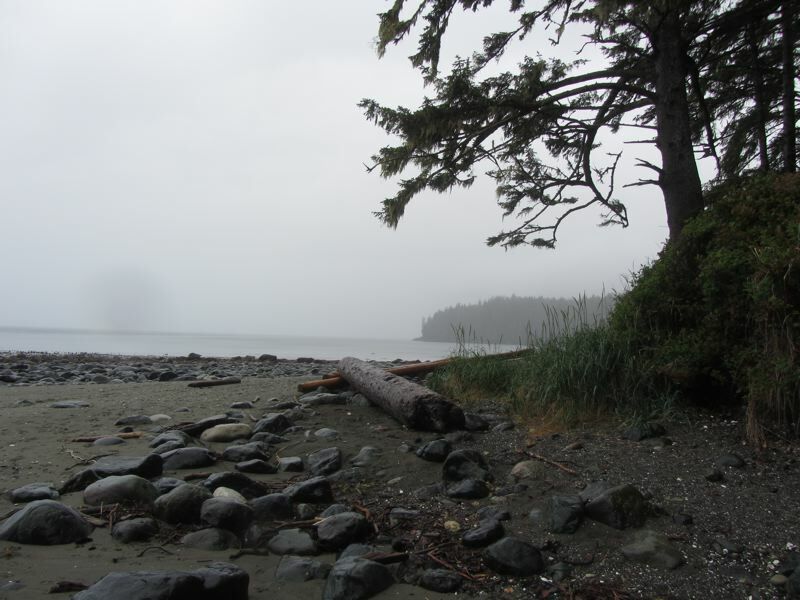 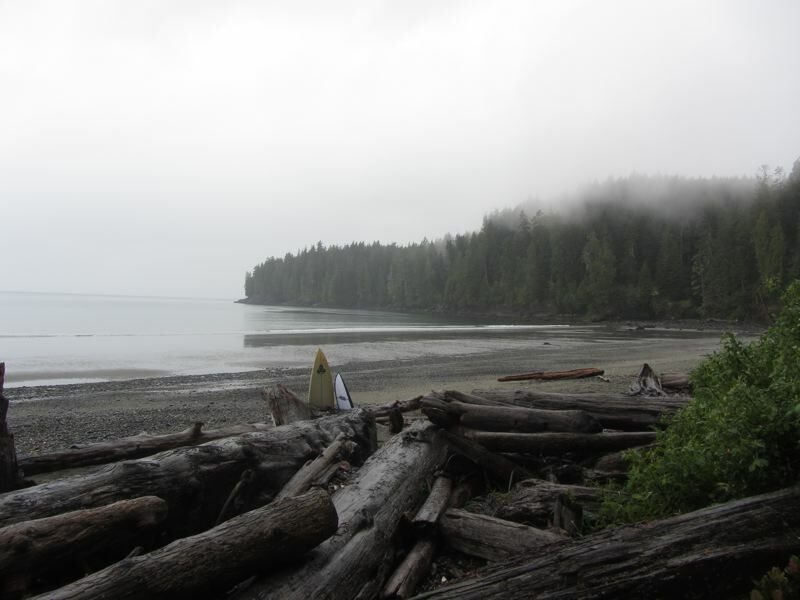 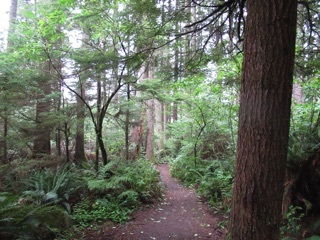 We made a brief trip across the Strait of San Juan de Fuca and wound up exploring China Beach. 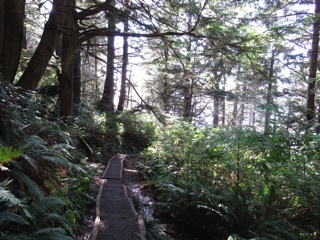 It's the first access point for the coastal trail, but we didn't have time to explore far. Still, we did get down to the beach and wandered a bit. 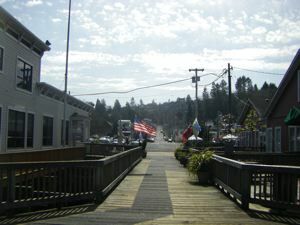 It's pretty country, so we're hoping to get back and explore more. We noted a while back that this does not seem to be a good year for sand on beaches, or on the Dungeness Spit. Still, the low tides tantalized us, so we went back, and this time there was a lot more sand. 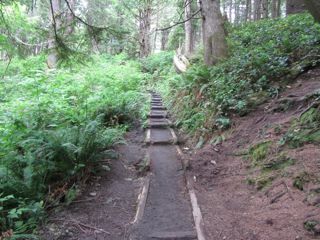 That made for easier walking. On our previous visit, we stumbled over rocks and stones. 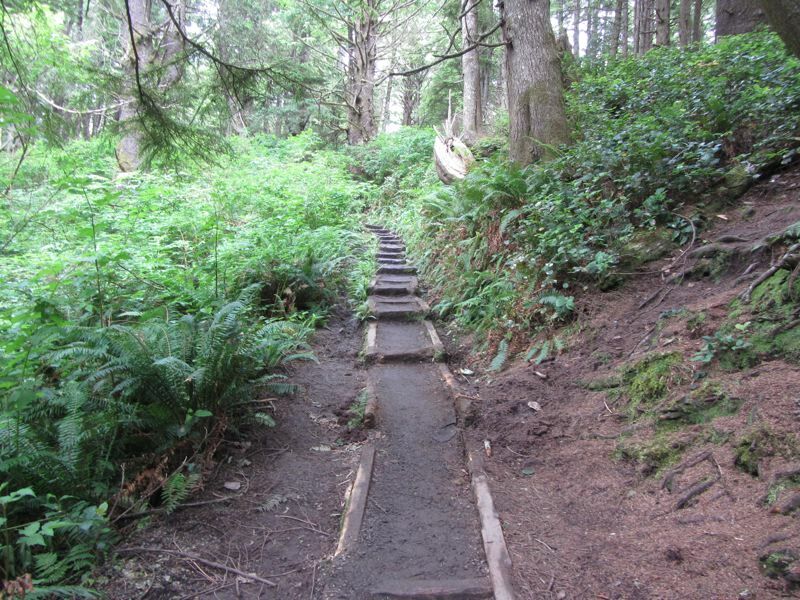 This time, we could just walk. 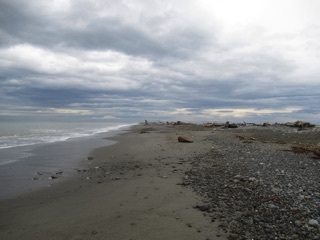 Like many things this year, the sand was delayed. 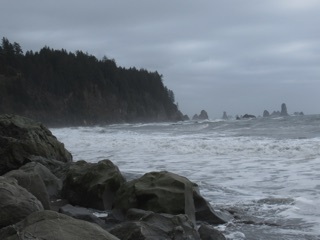 We recently took a trip to Long Beach in southern Washington, not far from the Oregon border. 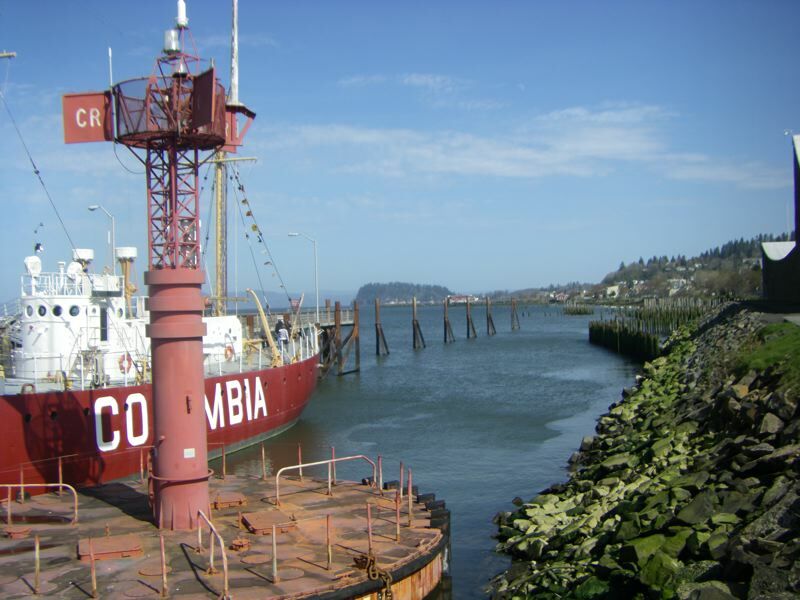 We took some pictures, ate some good food and learned a lot about the Columbia River, the Coast Guard and the Lewis and Clark expedition. 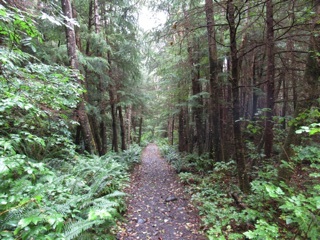 Follow some of the links to the right to see some of our photos. 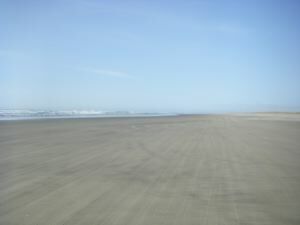 The Long Beach - Yes, there really is a long beach there, quite long. The Columbia River Maritime Museum - gave us a feel for the river, the sea, and those who work at their meeting place. Fort Clatsop - The Lewis and Clark expedition spent its first winter here. Ruby Beach is perhaps a two hour drive from Port Angeles. 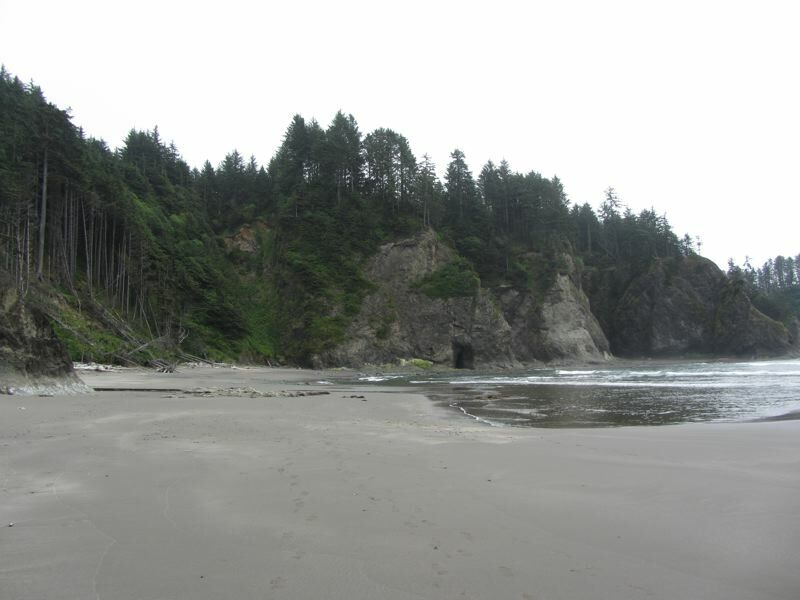 We haven't been there in fifteen years. 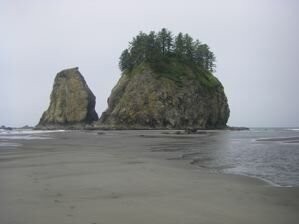 For some reason, Second Beach and Rialto Beach, which are closer, keep getting in the way. 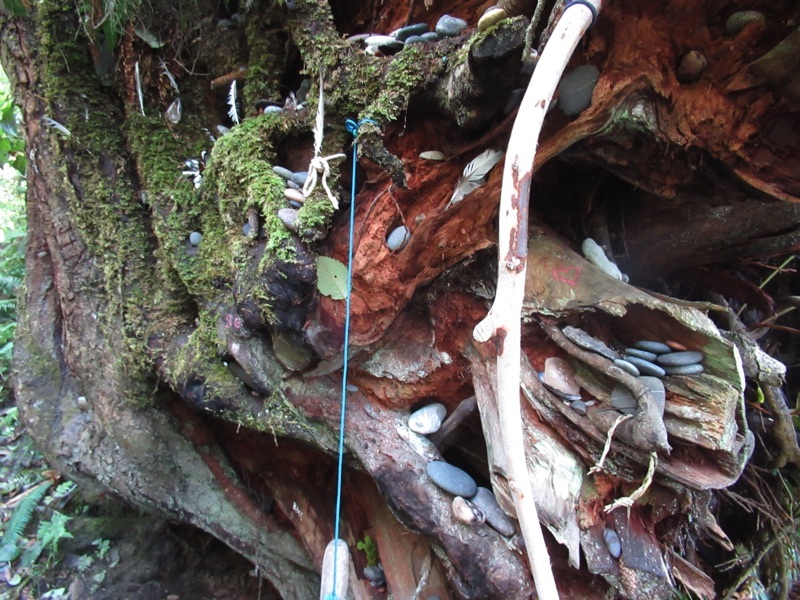 A few days ago we set out to remedy this and visited Ruby Beach again. It was a gray day, as so many are around here, but the beach was as beautiful as ever. It gets its name from the garnet in the sand there. 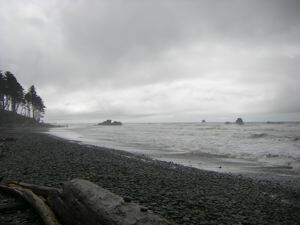 Ruby Beach isn't the longest beach in the area. 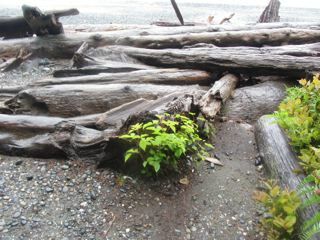 We spent about half an hour exploring. 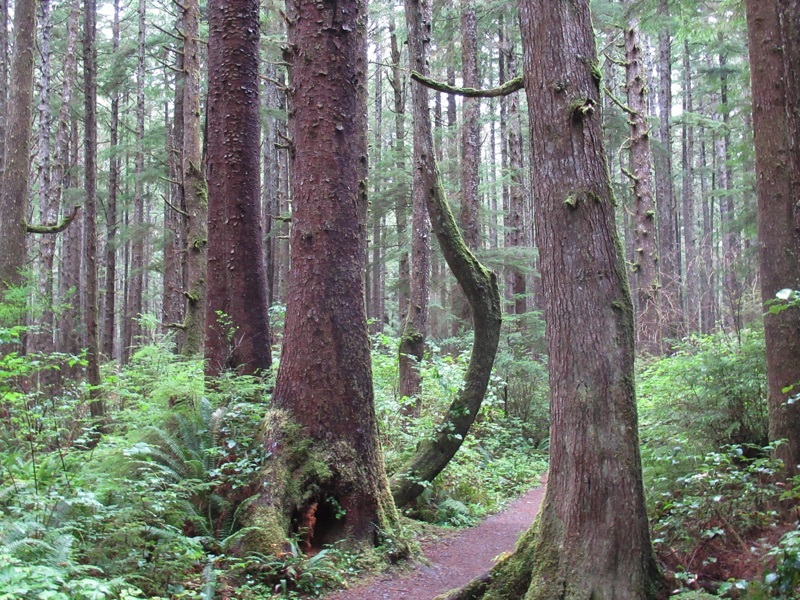 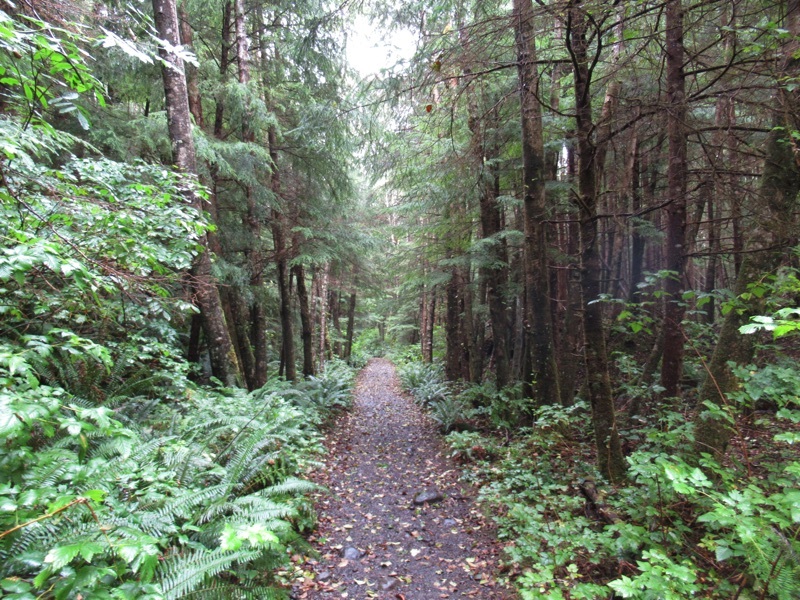 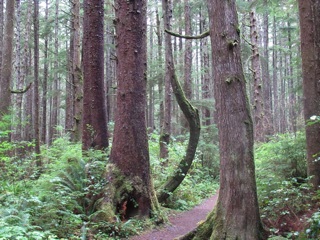 Still, it is one of the gems of Olympic National Park. Second Beach is probably our favorite beach on the West End, but now and then we like to get down to Rialto Beach for a bit of variety. 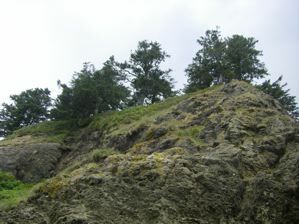 It's an easier hike. 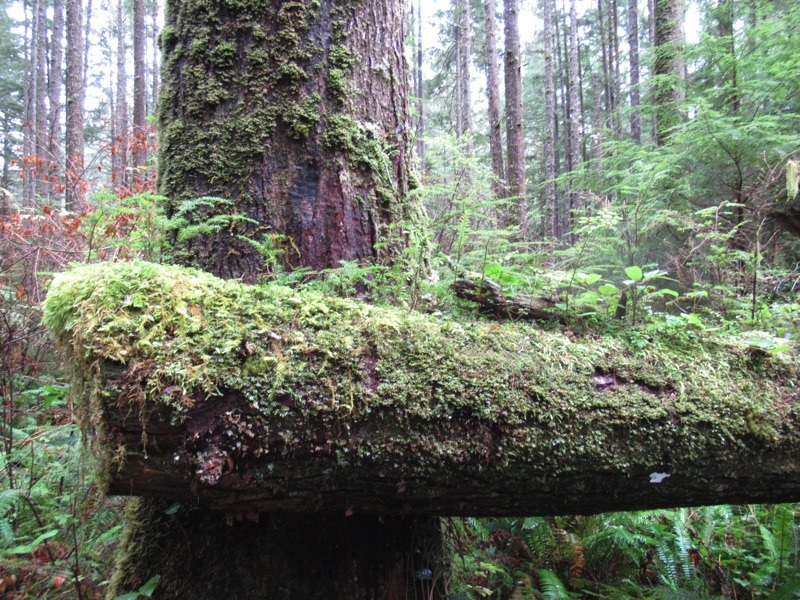 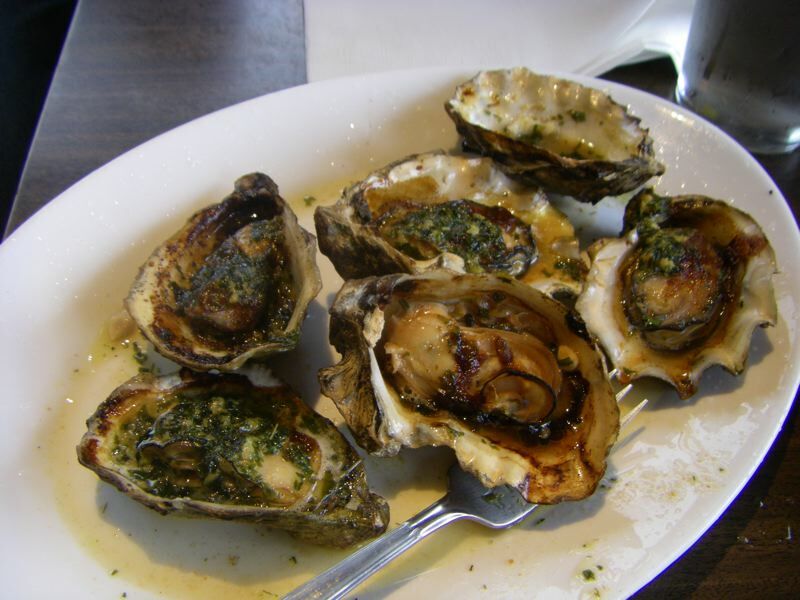 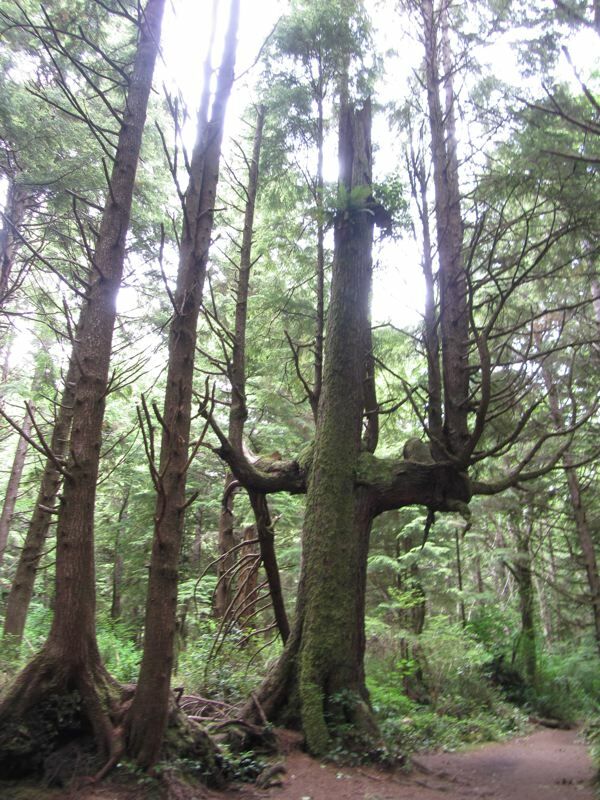 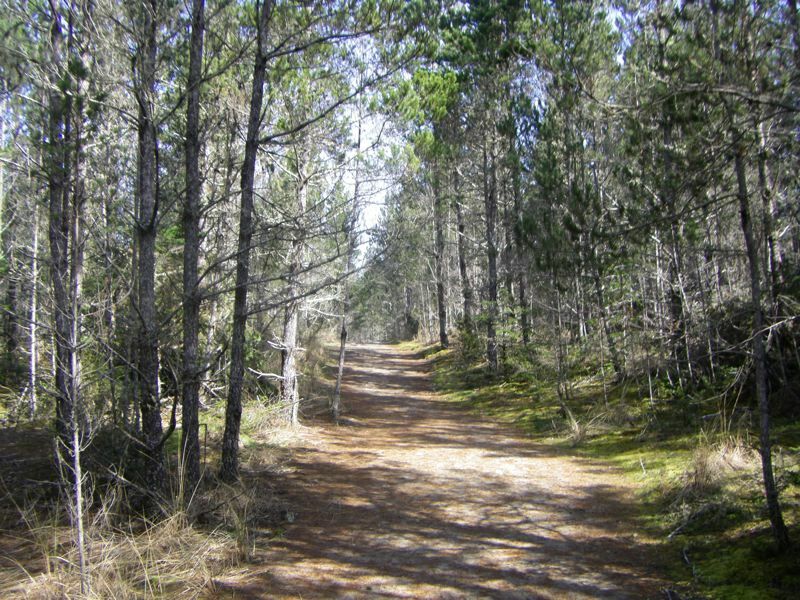 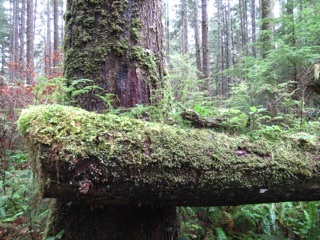 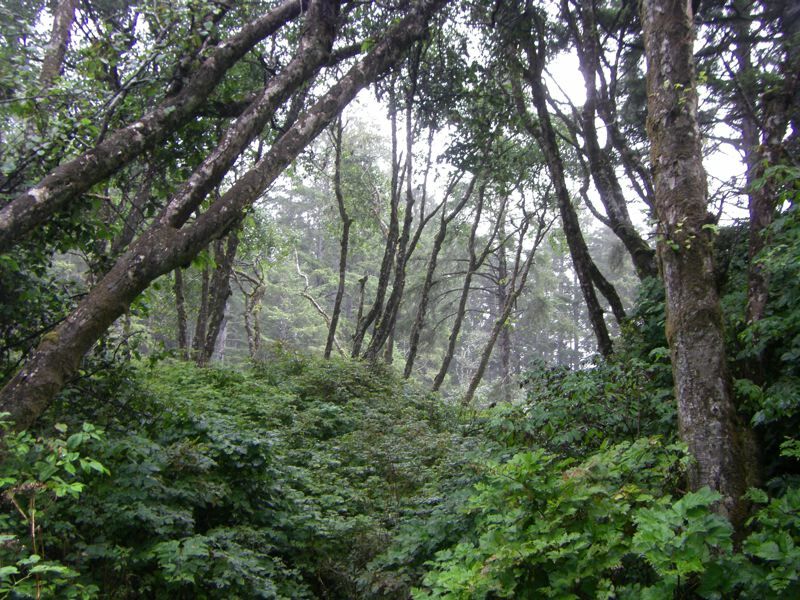 There's no climb through the coastal forest and no clambering over driftwood. 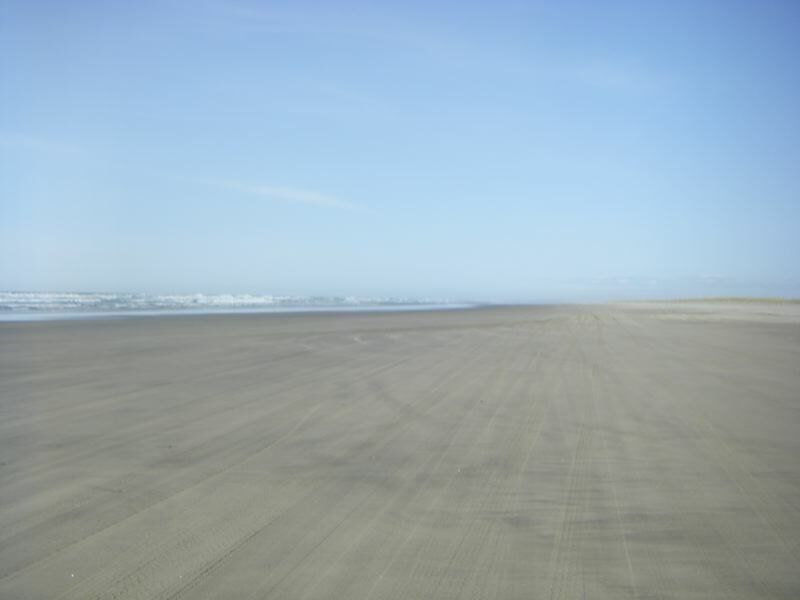 You just park, and you are on the beach. 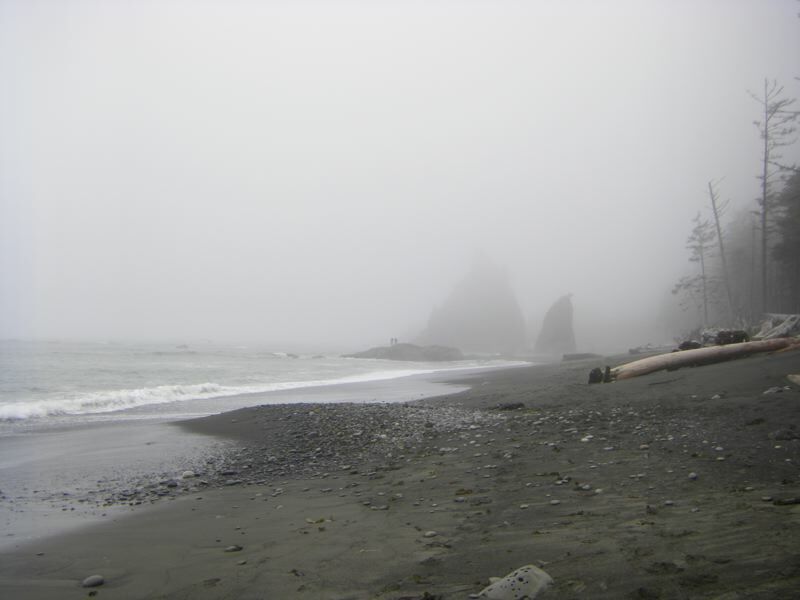 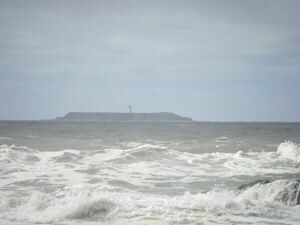 This time the beach was shrouded with Pacific fog, as it often is in the summer. The seastacks were invisible until we were nearly upon them. 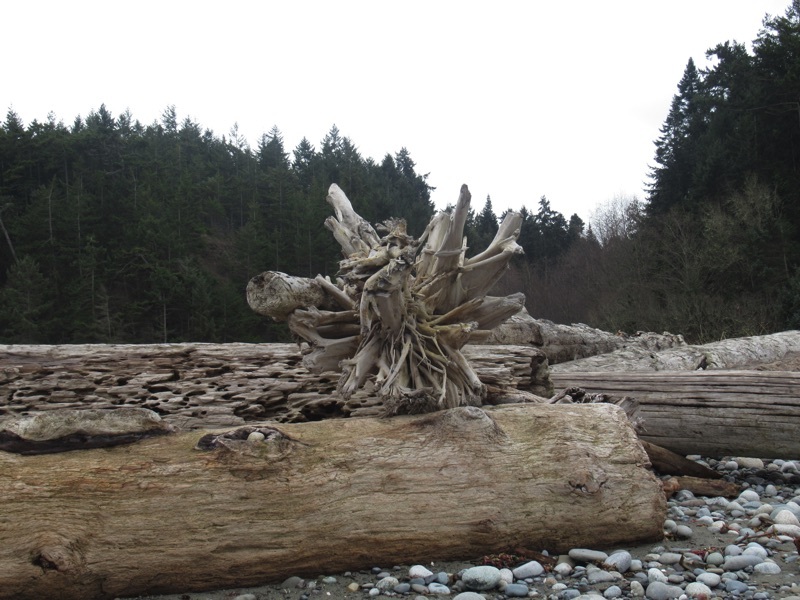 There was a lot of driftwood, but it was generally piled up high on the beach, even with a high low tide. 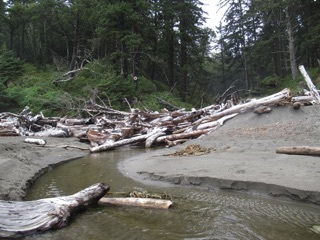 In another sign of summer, the little river about a mile from the parking lot ran under the sand to the sea. 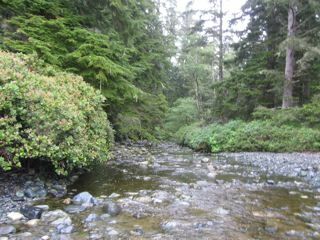 Most of the year we have to ford the stream, but this time we walked right over it without even noticing. We made it as far as the first headland climb, up into the rain forest. 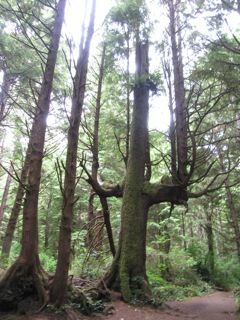 It was almost like climbing a ladder made of tree roots. 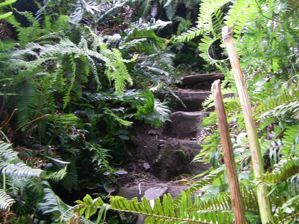 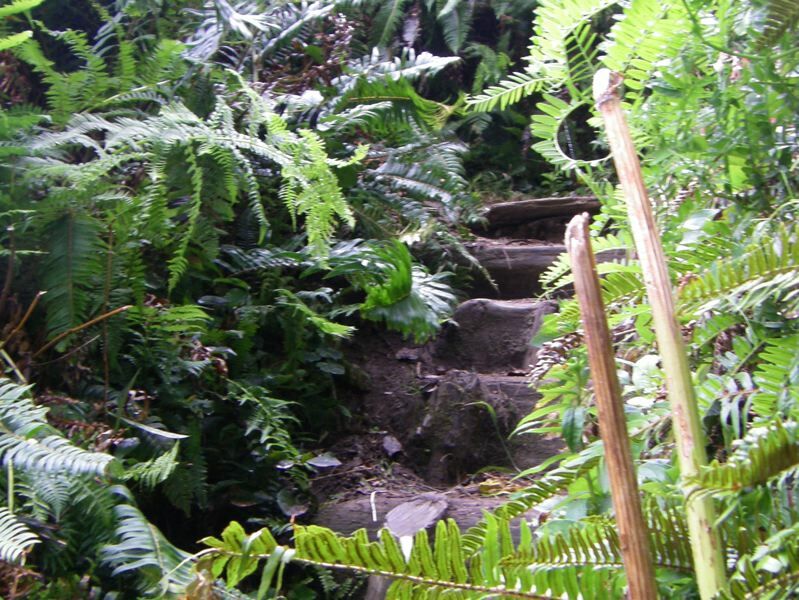 At the top, we could look through the foliage and see the rocky outcrop that jutted out to the sea like a lost Mayan temple in some adventure romance. 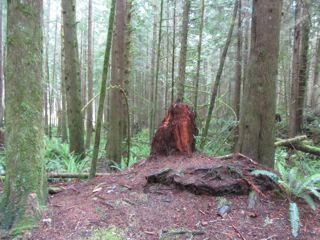 We turned around there. 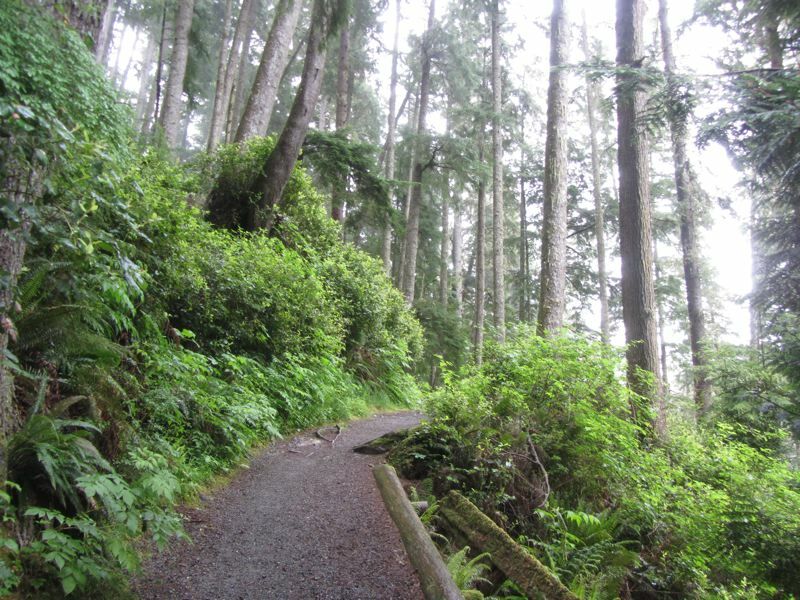 We like our adventures, but we like them bite sized. 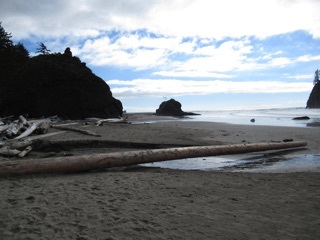 We've been visiting Second Beach for a number of years now, so we've been tantalized by the big seastack that lurks offshore just a bit south of the trailhead inland. 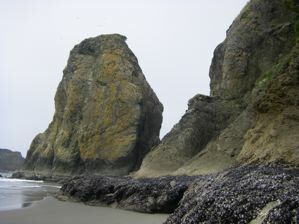 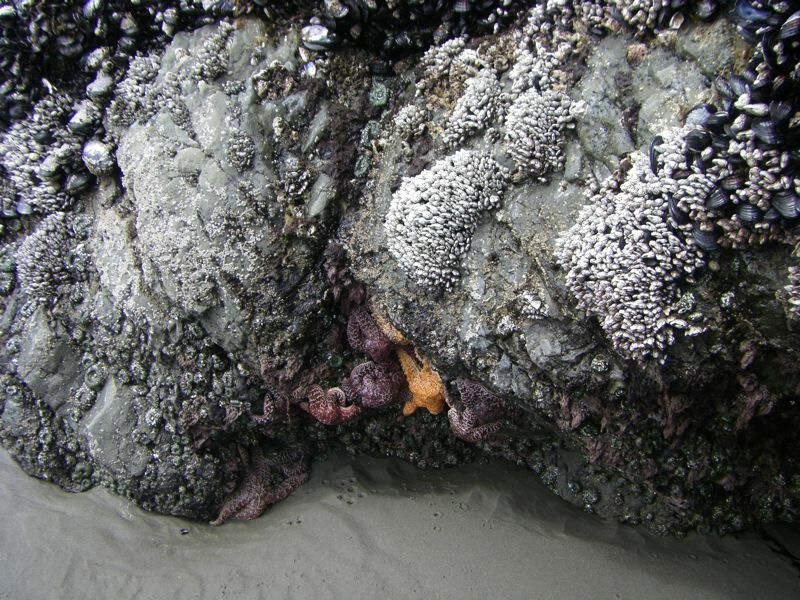 Since we usually visit Second Beach at low tide, it often seems as if we could just walk right out to this seastack. 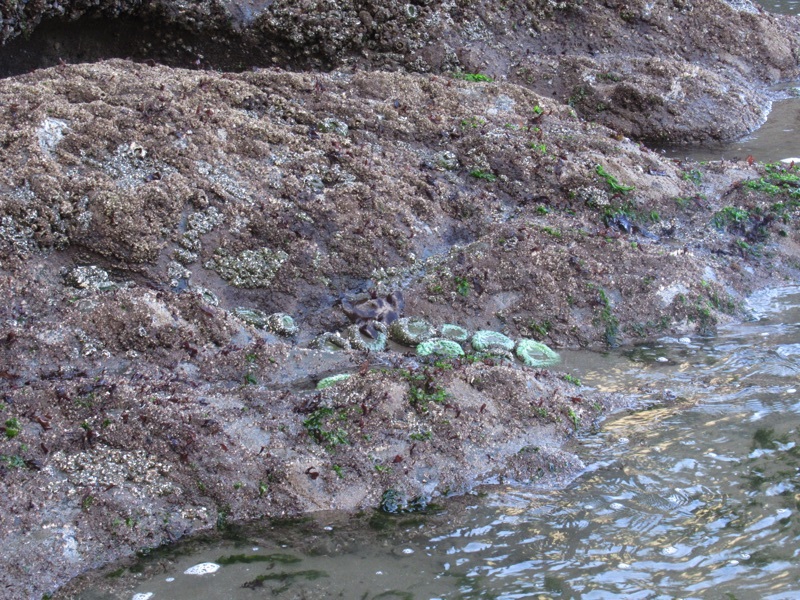 Of course, every time we have approached we have found a channel of water blocking us. 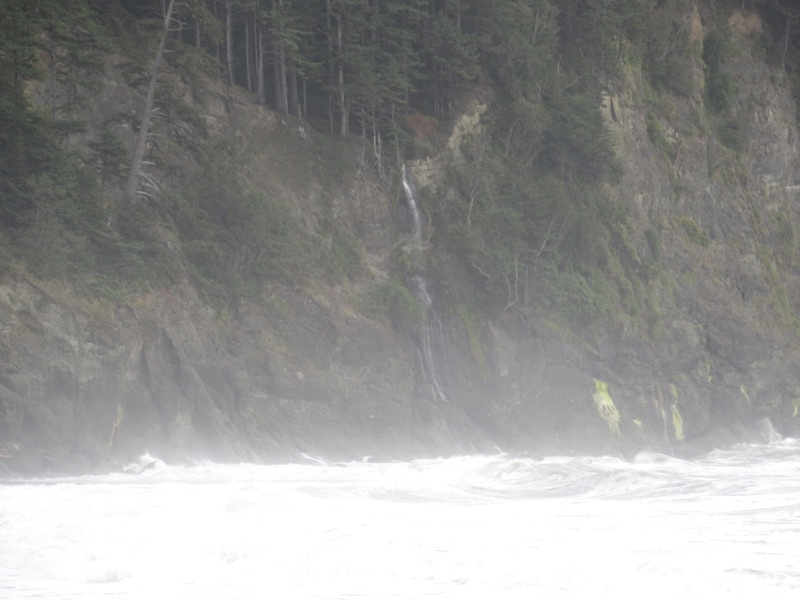 Sometimes it is fairly wide, but other times we are thwarted by a mere ten feet of choppy water of uncertain depth and current. This July 9th was different. This time no confounding body of water appeared as we approached the seastack. Yes, the sand was wet, but we were able to approach the base of the seastack dryshod. 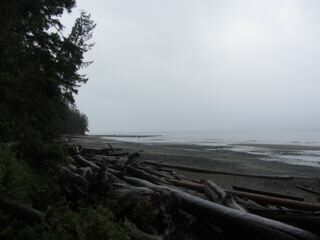 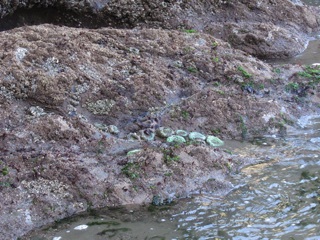 The low tide was 0.8 feet, but we had been to Second Beach with lower tides. It took a combination of low tide and sand flow to create the miraculous sandbar we traversed. 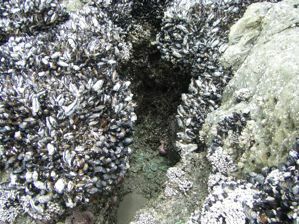 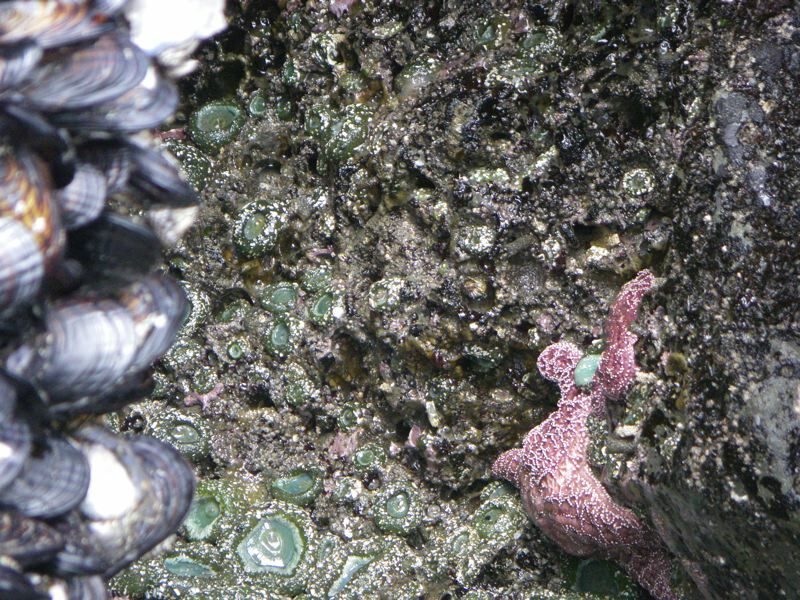 The base of the seastack was a jewel box of mussles and barnicles and lesser shells, here and there decorated with dazzling star fish. 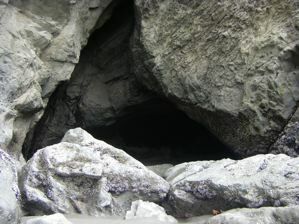 There were little caves, some worn into the stone and plain, others decorated like the seastack base. 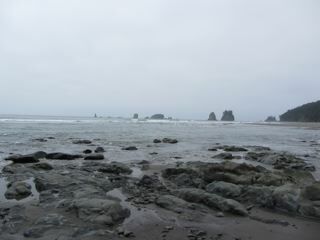 We made our way around the seastack, away from the beach. 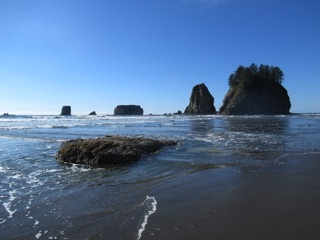 By carefully timing the waves we made it to the small beach between the large landward seastack and the smaller seastack behind it. 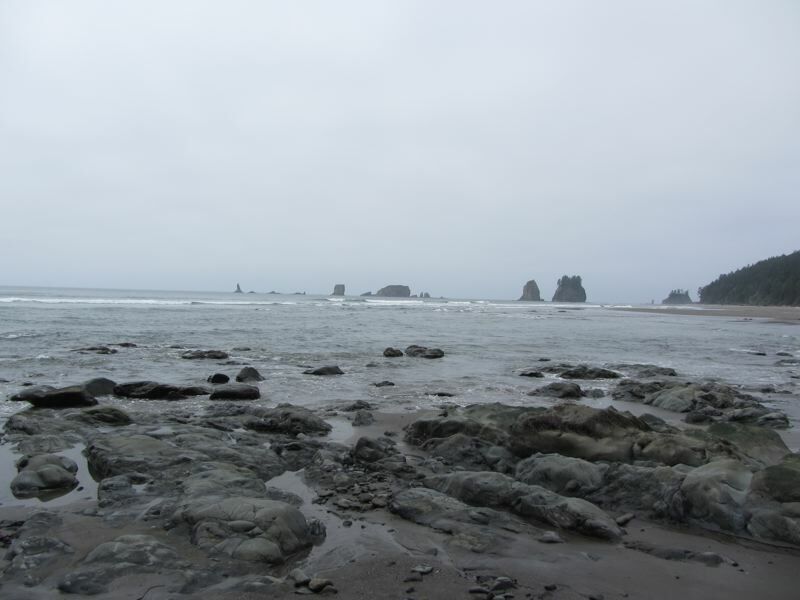 We explored a bit, admiring our own adventurousness, our good fortune, and the wonderful scenery. 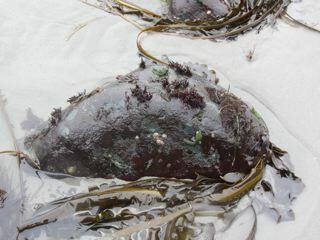 Not ones to press our luck, we made our way back after a brief sojourn, and explored the beachward face of the seastack. 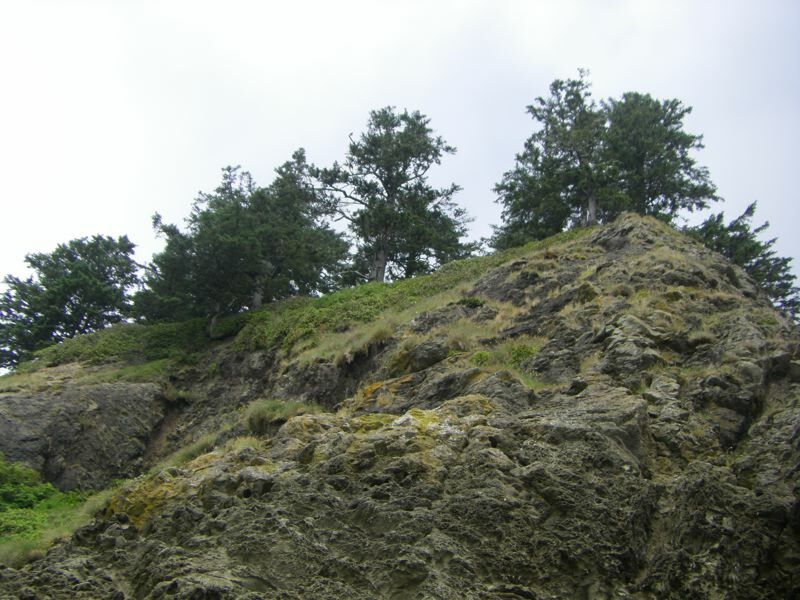 We have seen people climbing seastacks, and we considered climbing this one, but we Kalebergs have more the grace of gazebos than gazelles, so we settled for a sea level tour. 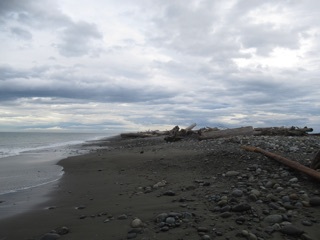 Our return to the beach along the sandbar was straightforward. 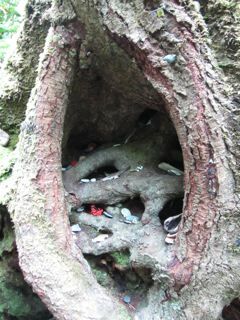 This is just as well. 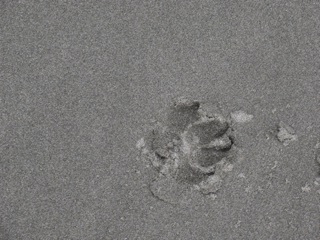 We always like to be able to retrace our steps. 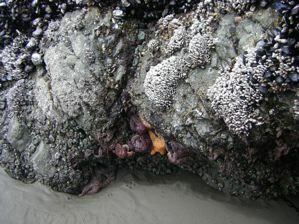 We then explored Second Beach to the south, wandering about the Pirate Cave and gawking at anemones in the various tidepools. When we returned to the sandbar that led to the seastack the tide had risen. A fair bit of the sandbar was already submerged. We had seized our opportunity. 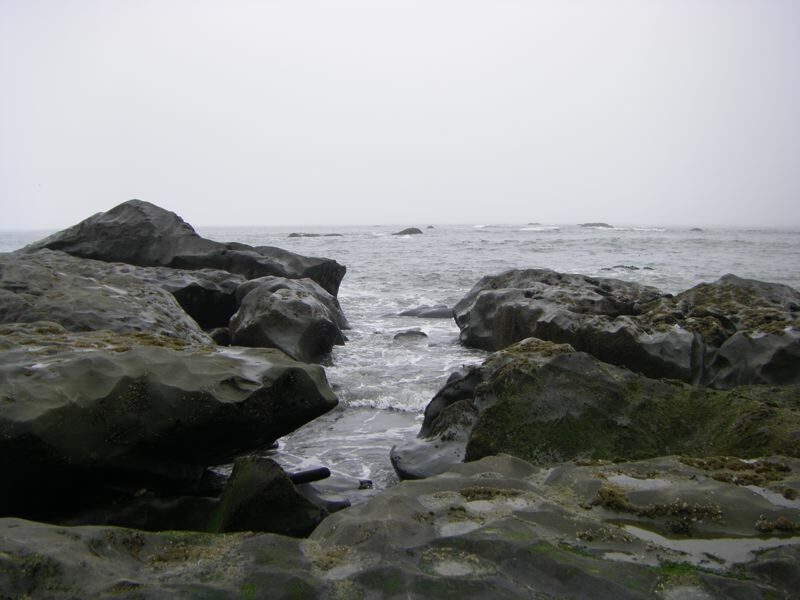 Time and tide, we knew, wait for no man. 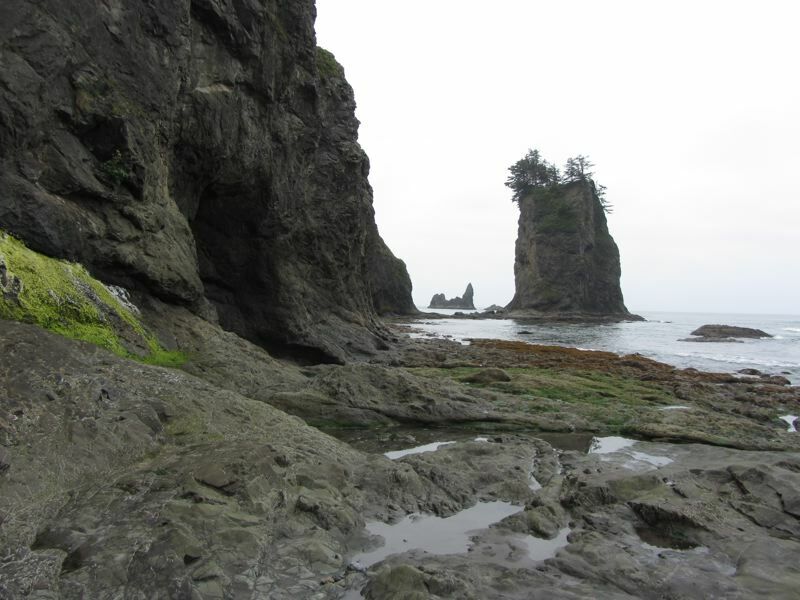 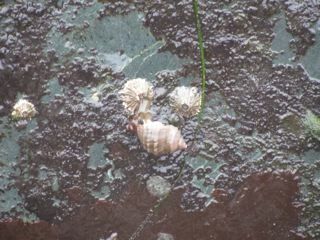 Seastacks are each a little world, isolated from our own. 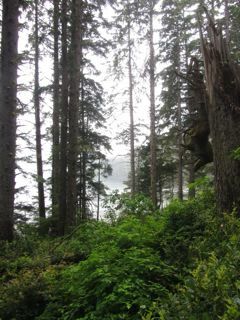 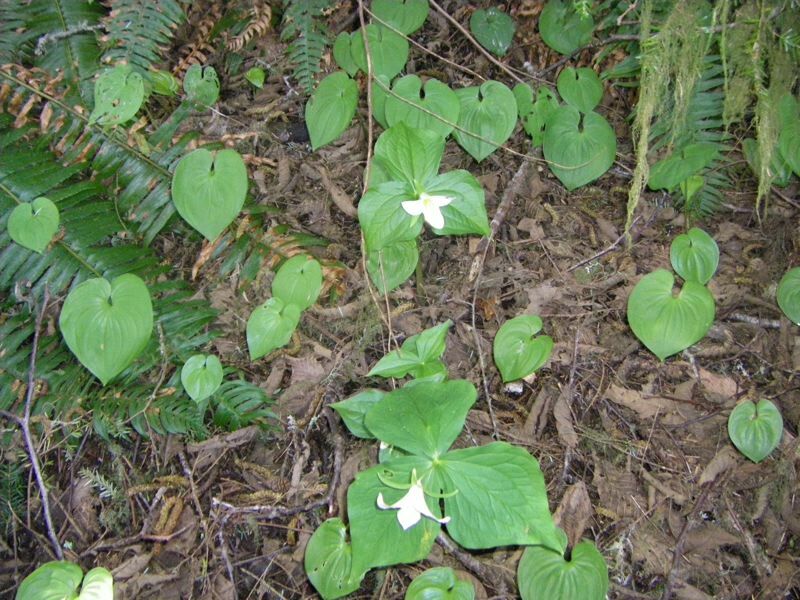 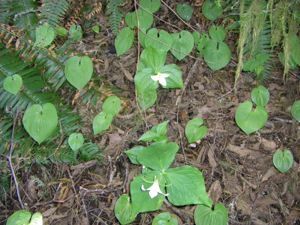 High above us grow forests, grasses, vines and, so we have been told, wild strawberries. 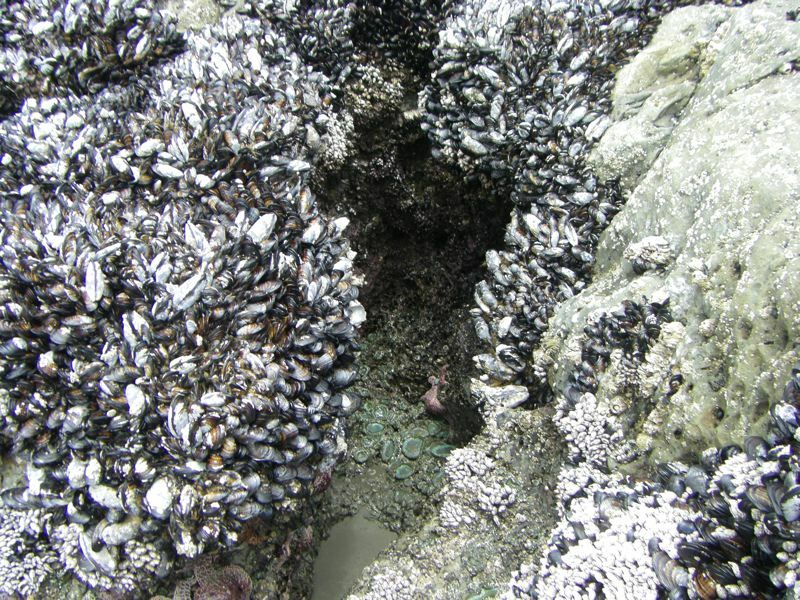 Our treacherous passage to the seaward seastack showing the mosaic of shells lining the base of the seastack. The surface is studded with shells and adorned with starfish. For the past few years we've been using TideCal to compute good times and tides for hiking the beaches of the North Olympic Peninsula. 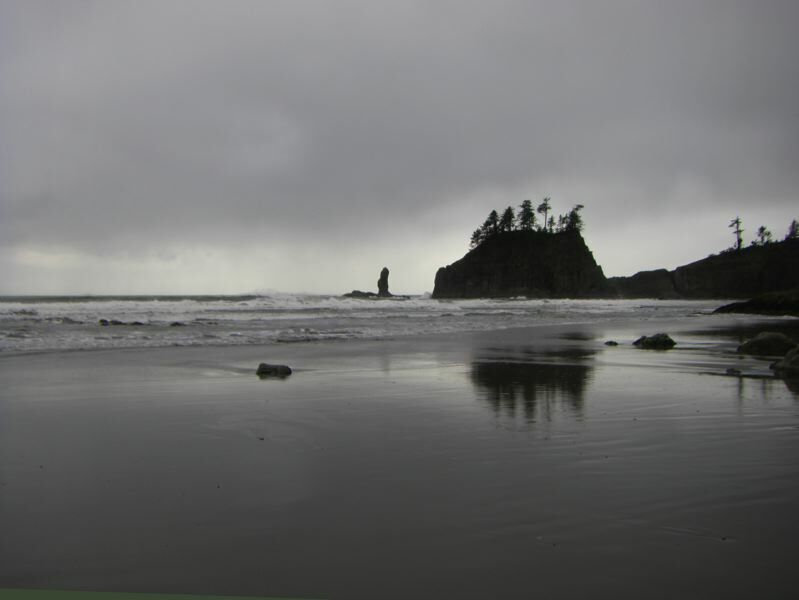 If you look at the left hand sidebar on this page, you'll see that we use TideCal to predict upcoming hiking tides. 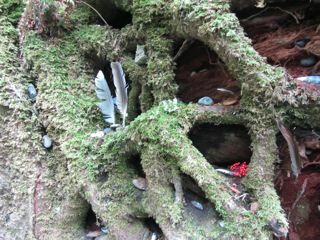 Apparently, a number of people like using iCal, the Macintosh calendar program, but it is sometimes hard to find the calendar you want. TideCal will make a hiker's tidal calendar, while other sites provide calendars with holidays, sporting events, historical birthdays and other such wonders. 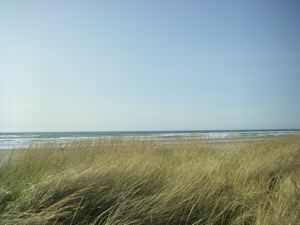 Now there is an iCal calendar generator for people who just want to know when the sun will rise and set. 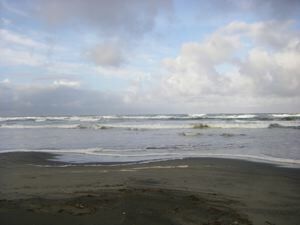 We call it Sunrise Sunset. 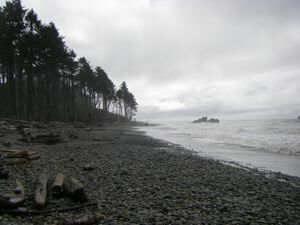 In the traditional of fine Kaleberg Kludges, it requires that you know your latitude and longitude (try getting a map bookmark from Google Maps), your time zone offset, and if you aren't in the US, when daylight saving time starts and ends. 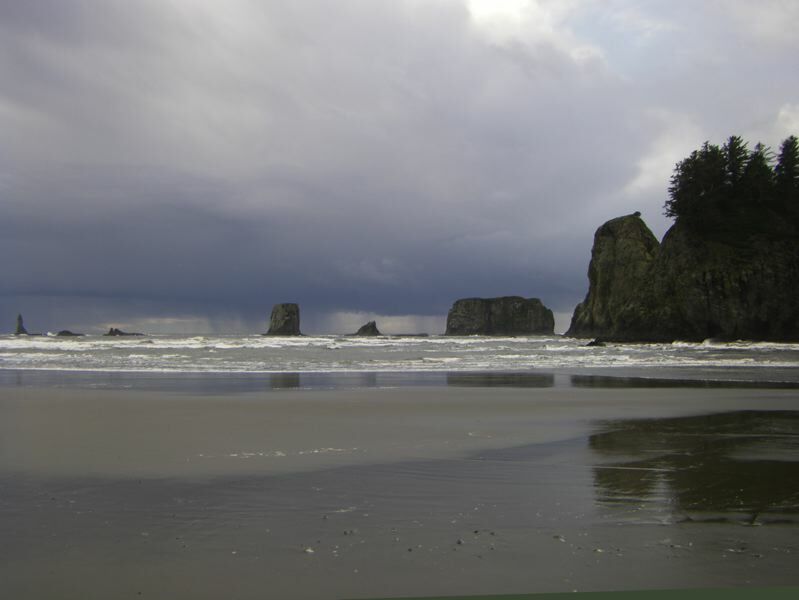 We make no warrantees or representations, just software.